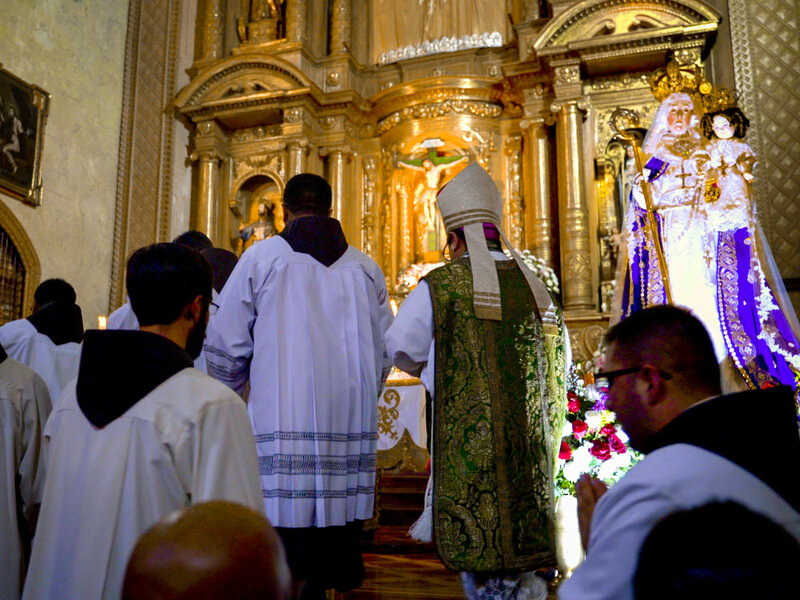 The Fifth installment of the Buen Suceso conference series, given by Fr. 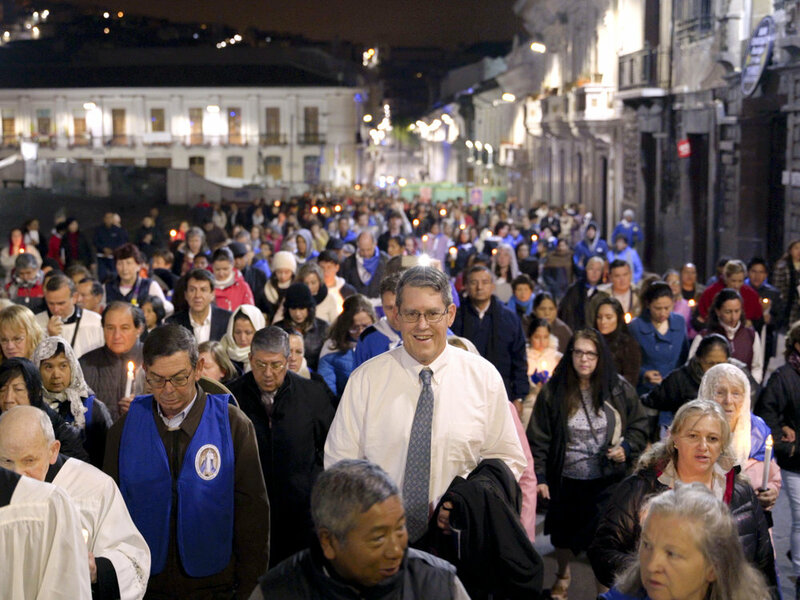 Adam Purdy in Quito Ecuador during the novena leading up to the Feast of the Purification, discusses how it is that we have come to know the details of the Life of Mother Mariana de Jesus Torrez, a Conceptionist Nun who saw and spoke with the Blessed Virgin Mary late in the 16th and early in the 17th Centuries. Father Purdy lays out for us the story of how the initial manuscript of The Admirable Life of Mother Mariana was written in 1790 by Fr. 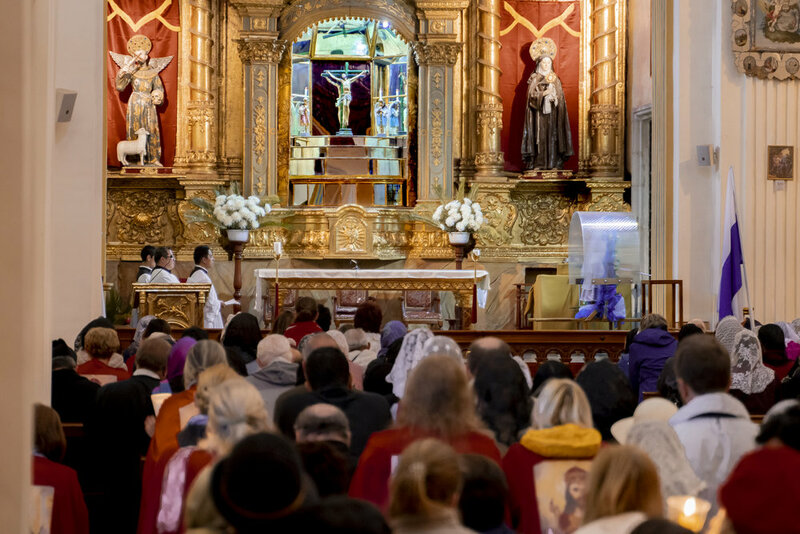 Manuel Sousa Pereira, and the incredible story of how the life of Mother Mariana has been transmitted to us over 220 years later. Fr. 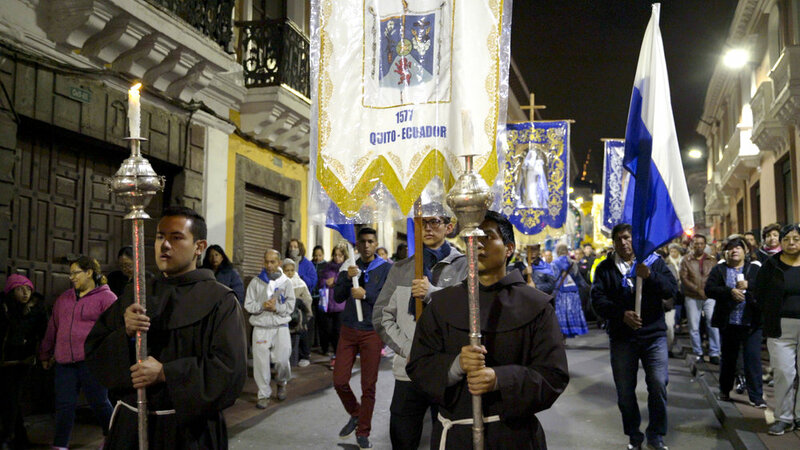 Purdy also discusses the history of the city of Quito, Ecuador, the history of the Franciscan Conceptionists, and the nature of Marian apparitions, and how they are scrutinized and approved by competent authorities. 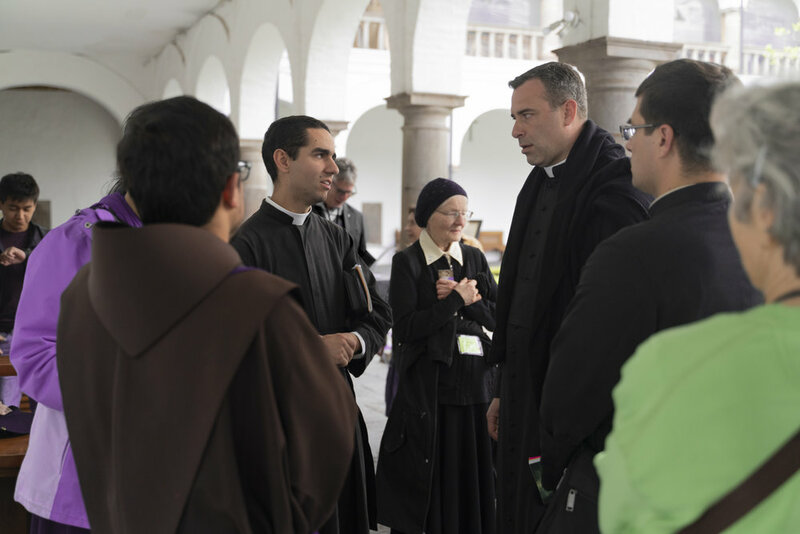 This is the second installment in a series of conferences by Fr. 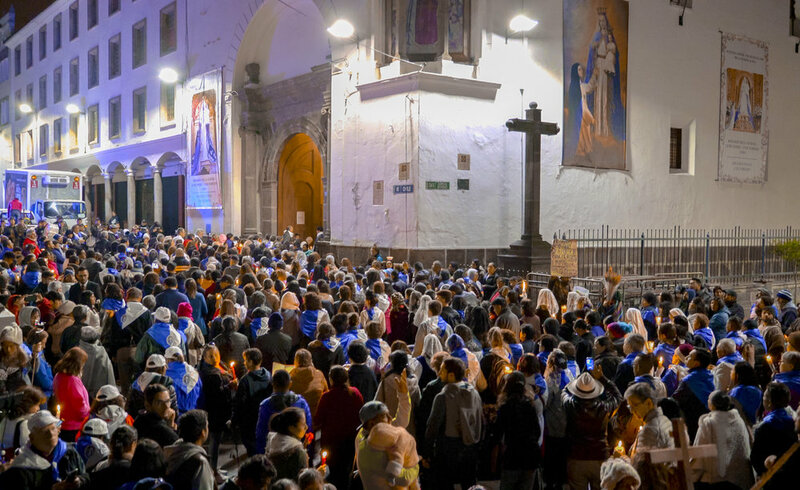 Adam Purdy on the significance and the meaning of the apparitions of Maria del Buen Suceso de la Purification to Mother Mariana de Jesus Torres in Quito, Ecuador. 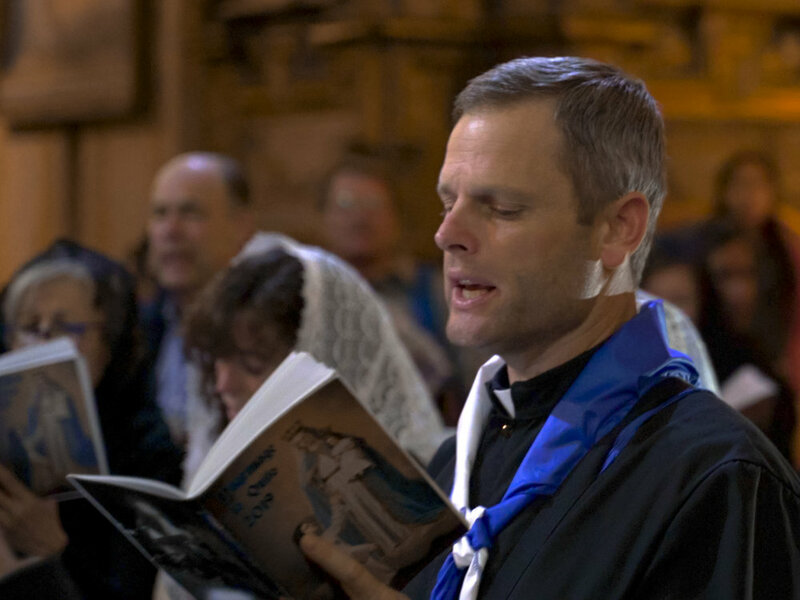 In this conference, Father Purdy walks us through a detailed history of sacrifice; from the first sacrifice after the fall of Adam, to the sacrifices of Noah, Abraham, Aaron & the Levites, and culminating in the sacrifice offered by the Blessed Virgin Mary in the Temple on the day of her Purification and the ultimate sacrifice of Our Lord on the Cross. 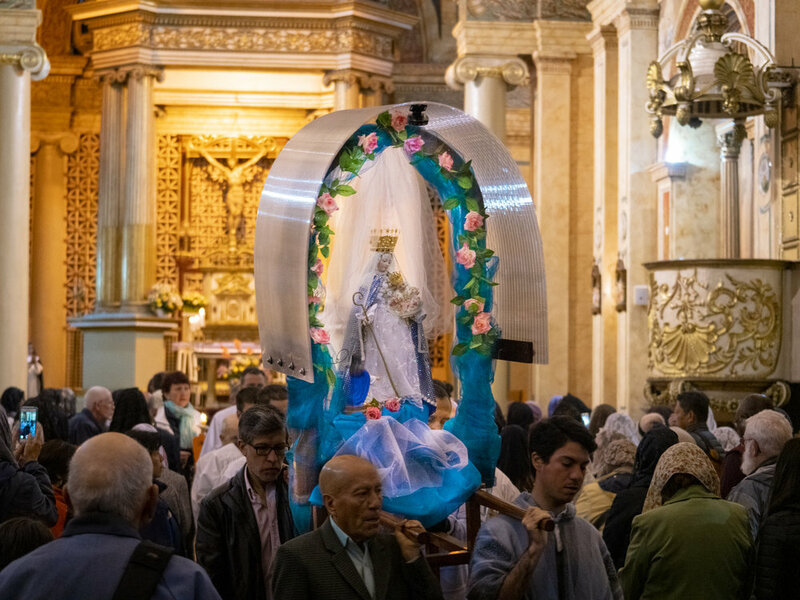 This history is integral to truly understanding WHAT the purification of the Blessed Virgin Mary is, it's relation to the priesthood and the religious life, and why it is important that Our Lady took the name Maria del Buen Suceso de la Purification when she appeared to Mother Mariana de Jesus Torres in Quito, Ecuador. 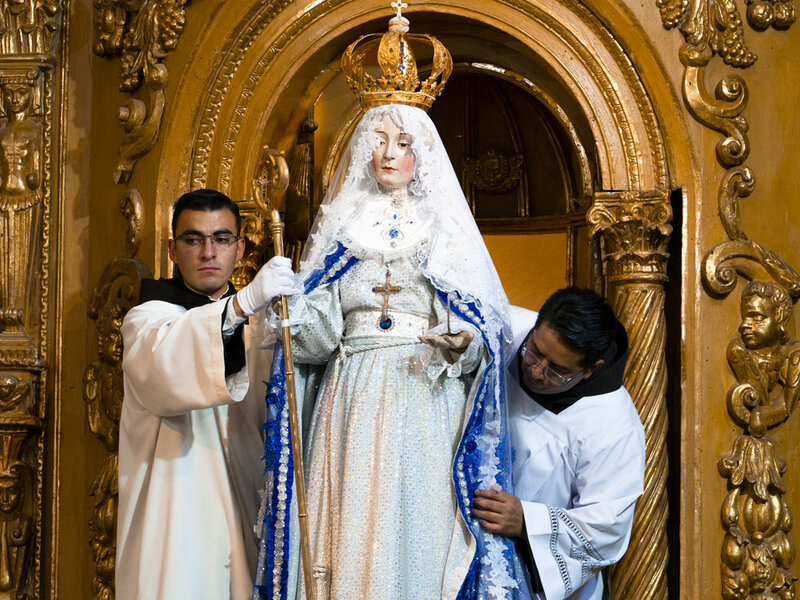 Father Purdy also discusses in detail the 'Quasi-Priestly' role that Our Lady plays in the mystery of redemption, using the principles Saint Thomas Aquinas on analogy. This is the first in a series of conferences by Fr. 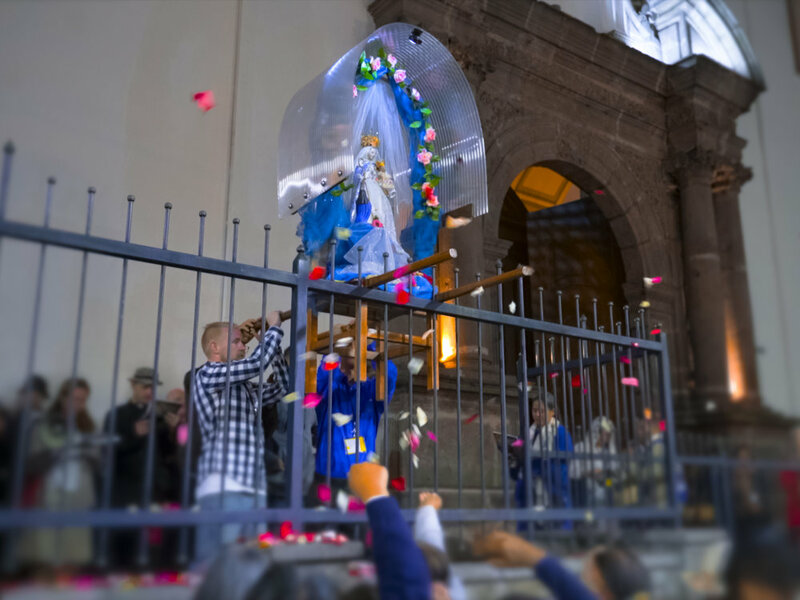 Adam Purdy on the significance and the meaning of the apparitions of Maria del Buen Suceso de la Purification to Mother Mariana de Jesus Torres in Quito Ecuador. 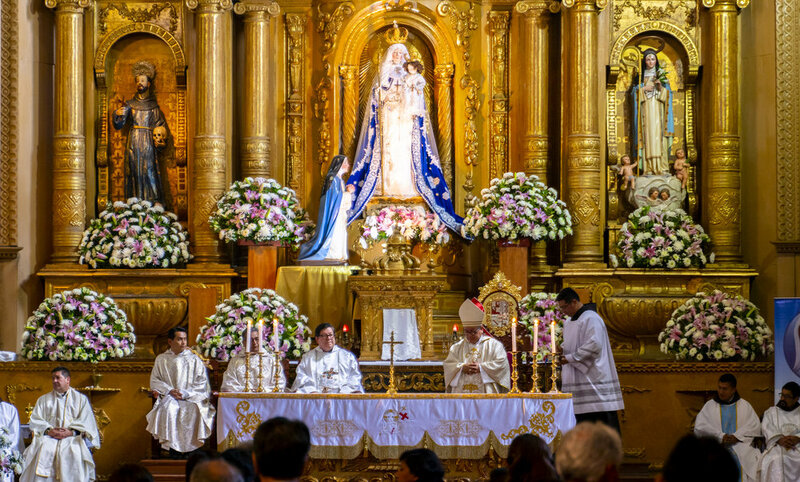 This first conference aims to clarify the significance of the title of Our Lady, as it was given to Mother Mariana in 1610. 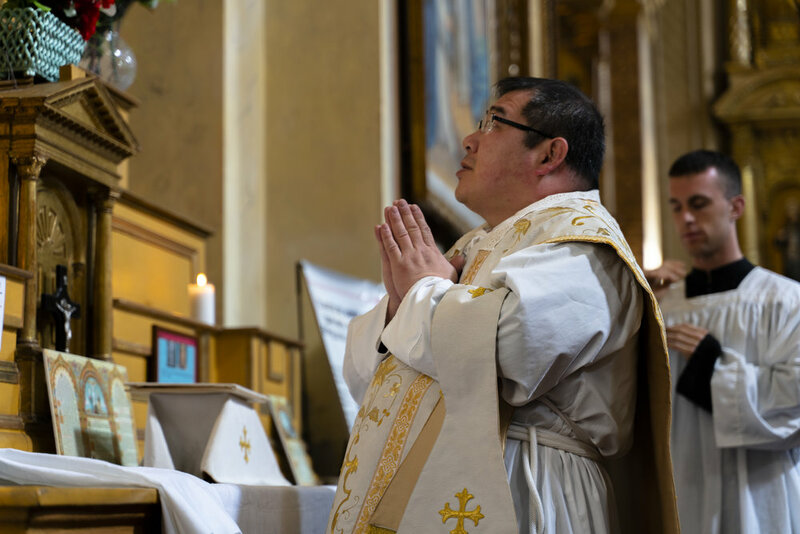 Father shows how this title of Our Lady is intimately linked to the Religious Life, the Priesthood, and the sacrifice made by the Blessed Virgin Mary in the temple, when she offered her Divine Son unto the death of the cross. Conferences 1 and 2 fit hand in glove, so be sure to subscribe to the channel and click the notification bell to get a notification as soon as we publish the next conference! 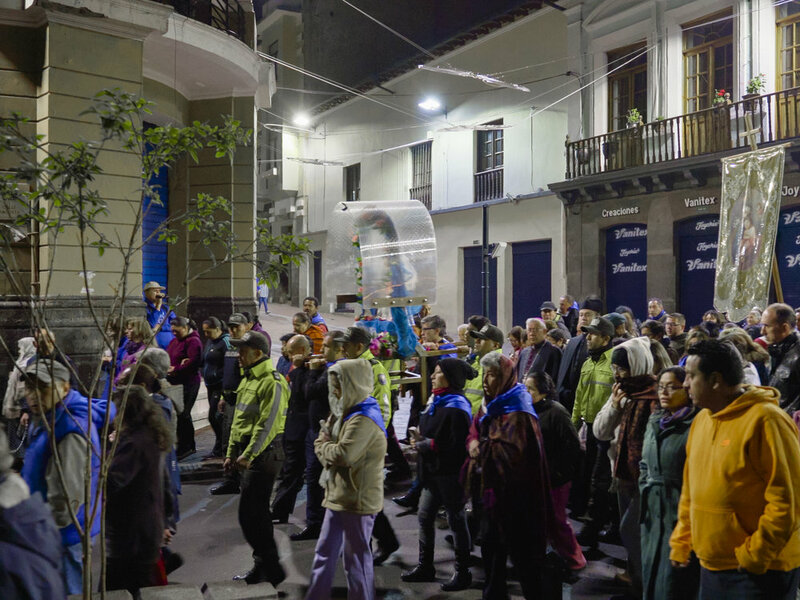 The feast of the Purification was very special in Quito, Ecuador this year. 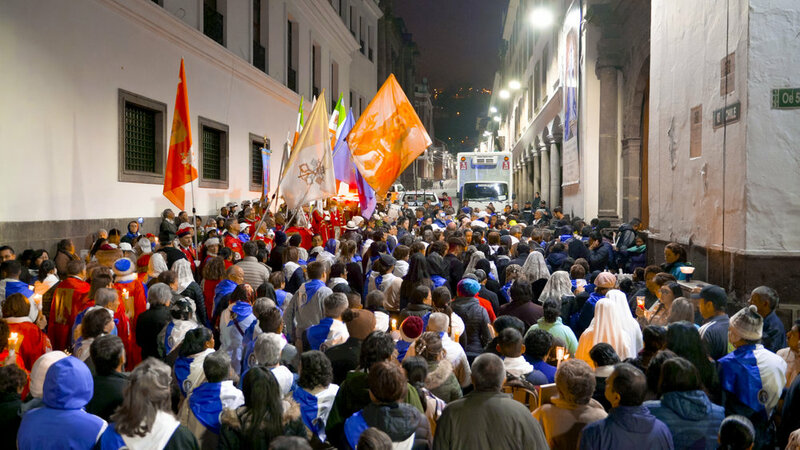 For the Fiesta of Maria del Buen Suceso de la Purificación, the Archbishop of Quito, His Grace Fausto Gabriel Travez and the Franciscan Friars led the procession for the first time in living memory. Watch the video to find out more! 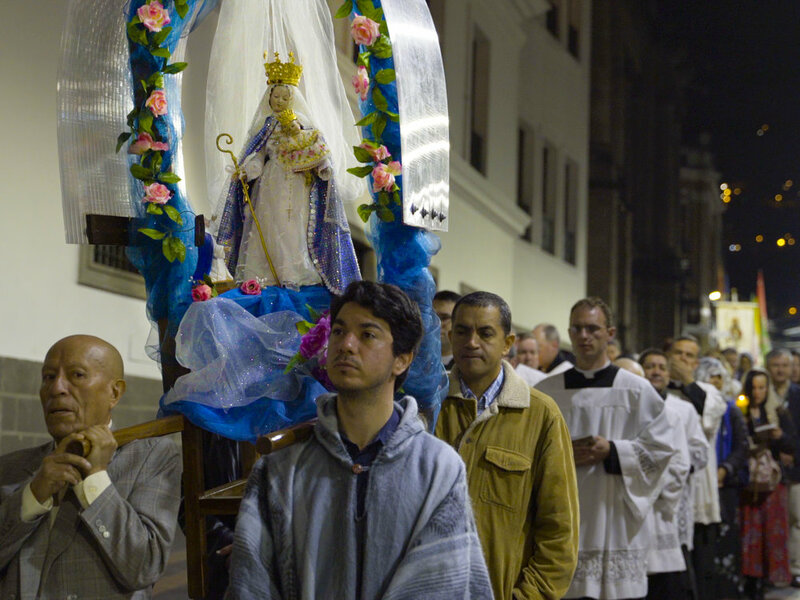 The devotion to Our Lady of Buen Suceso of the Purification was intended specifically for our time - the 20th century. 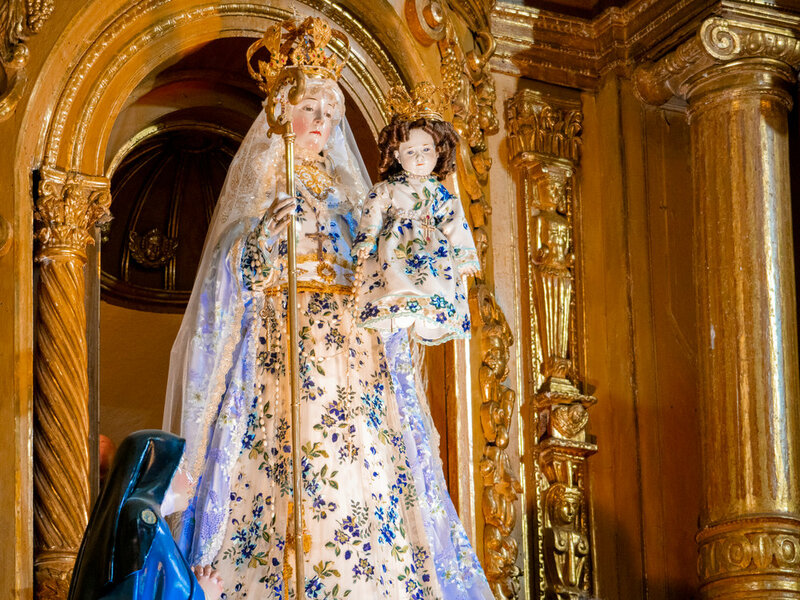 In the interim between the 16th and 17th centuries when Our Lady appeared to Mariana de Jesus Torres, and today, this devotion was largely forgotten by a great number of people, and went unknown in most of the world, until the 20th century. As a result, this novena has laid dormant until the past decade when priests and faithful from all around the world rekindled this devotion. 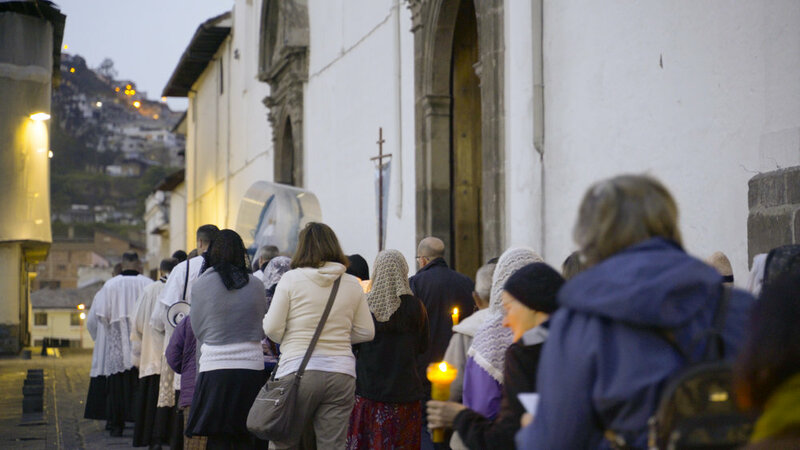 The original novena, as prescribed by Bishop de Ribera, called for the religious communities to preach on the spiritual life and the importance of religious vocations. 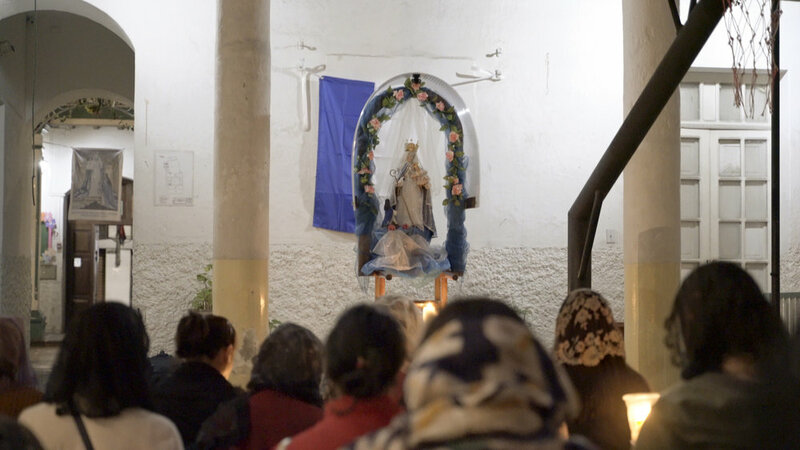 The revival of this novena has taken a new form: each day at 5:00 am, priests and pilgrims process with a smaller statue of Our Lady of Buen Suceso and Mariana de Jesus Torres, to various religious houses, convents, monasteries and churches. 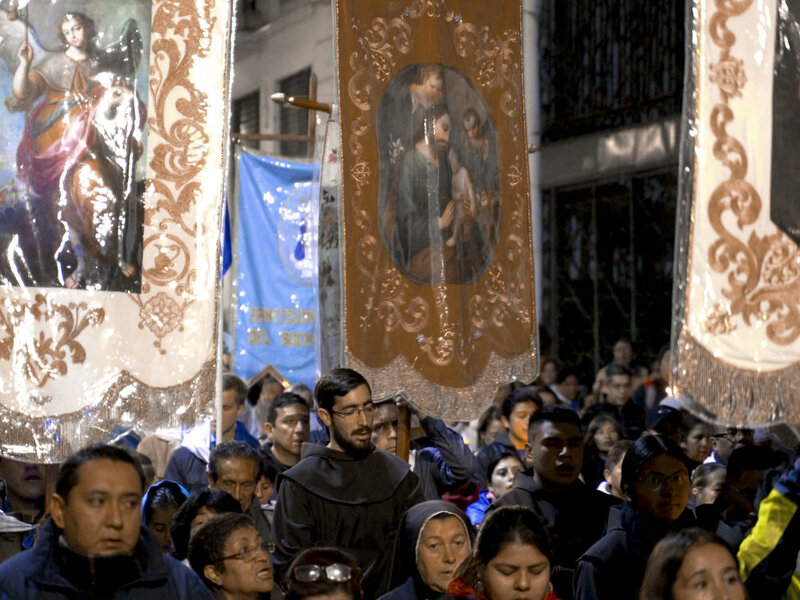 This year, pilgrims brought the statue and the message of Our Lady of Buen Suceso of the Purification to the Augustinian Missionaries, the Carmelites, Sisters of Providence, the Jesuits, the Mercedarians, the Augustinian Sisters, the Dominican Sisters, the Sisters of Charity, the Clarisas, the Oblate Fathers of the Sacred Hearts of Jesus and Mary, and the Franciscans. The pilgrims who came from America, Canada, Austraila, Mexico, Switzerland, Triniadad, Poland, Chile, Argentina and all over the world. They came in a spirit of prayer and penance, with profound love for the Blessed Mother, to pray for the Church in this time of crisis. 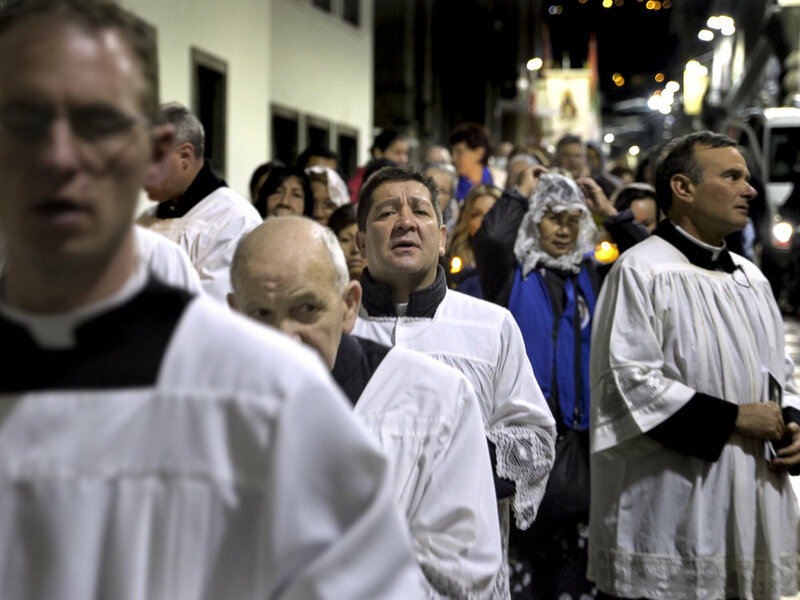 Below are some photographs taken throughout this year’s 9 day novena. 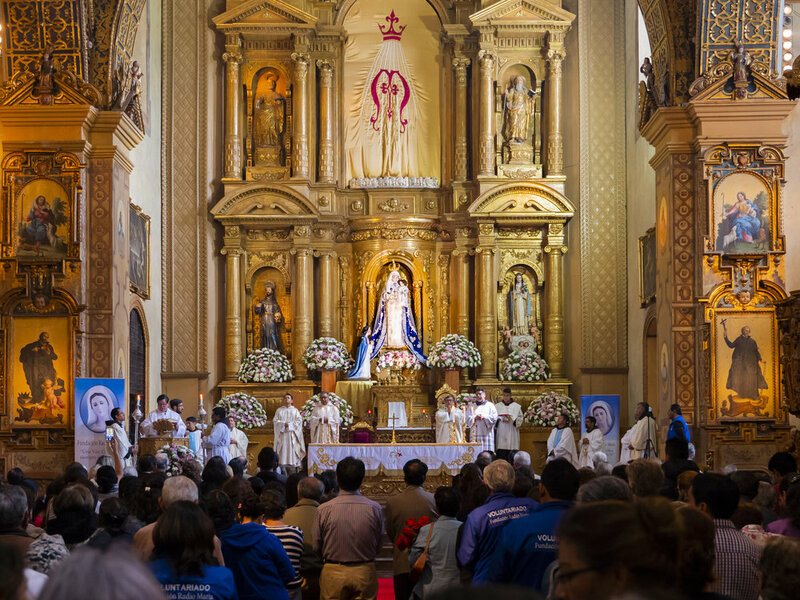 As many people heard, this celebration of Maria del Buen Suceso de la Purificación was very special this year for a number of reasons. 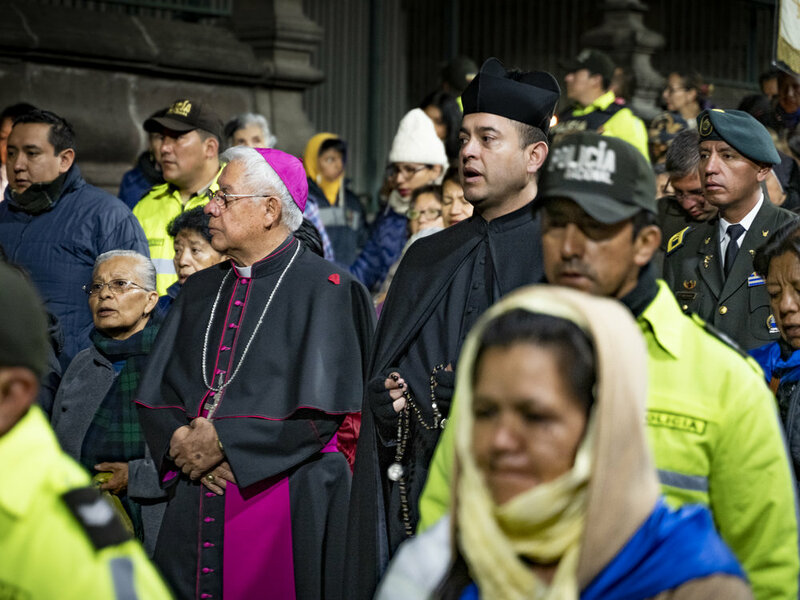 First of all, this is the first time during his tenure as Archbishop of Quito, that His Grace Gabriel Fausto Trávez Trávez attended the celebrations. 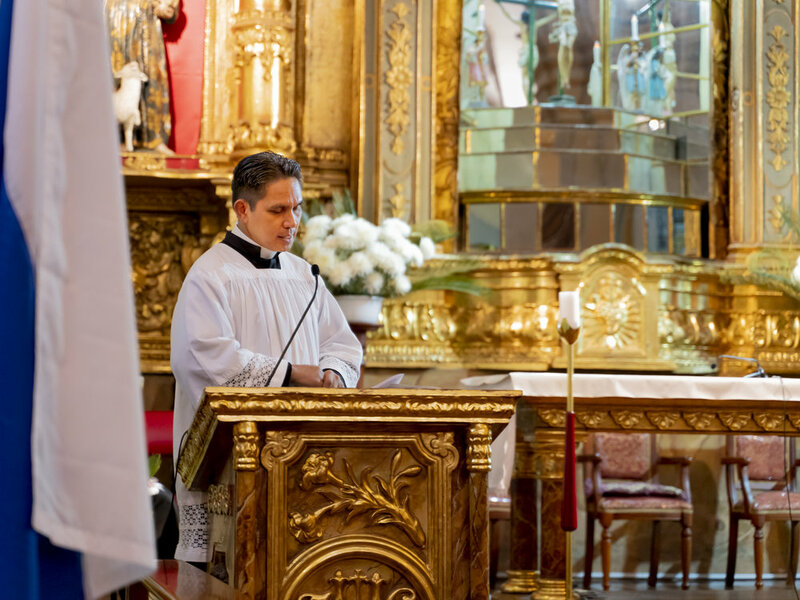 His Grace made his first appearance on the evening of January 23rd, when he came to the Convent of the Immaculate Conception to witness the transportation of the miraculous statue of Our Lady of Buen Suceso of the Purification to the main altar. 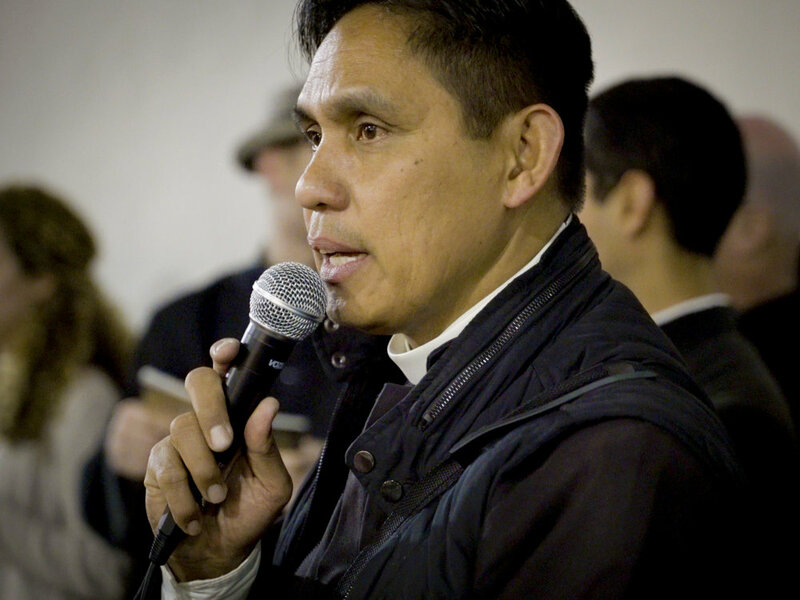 Archbishop Fausto Trávez is a former Franciscan, and the Conceptionist Sisters are a part of the Franciscan Order as well, since they adhere to the Rule of Saint Claire. 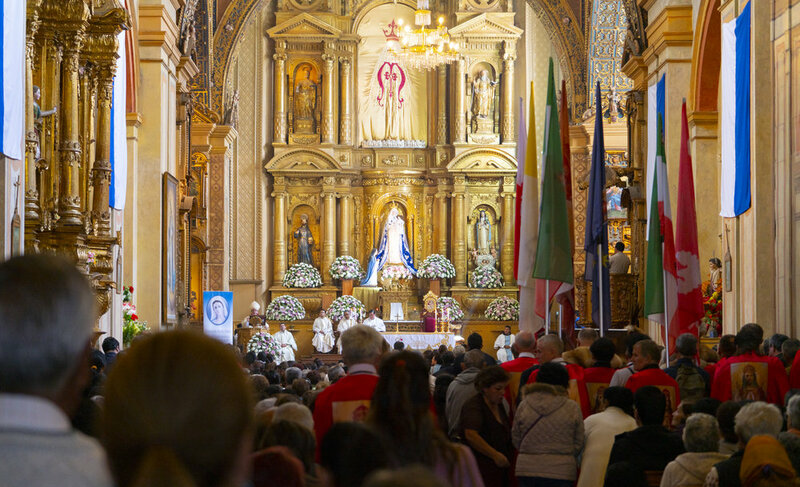 What is even more significant is that the Franciscan Friars of Quito, for the first time in decades, preformed the task of carrying the miraculous image of Our Lady down from the Upper Choir of the convent and placed her onto the main altar, where she is venerated by pilgrims from all around the world. 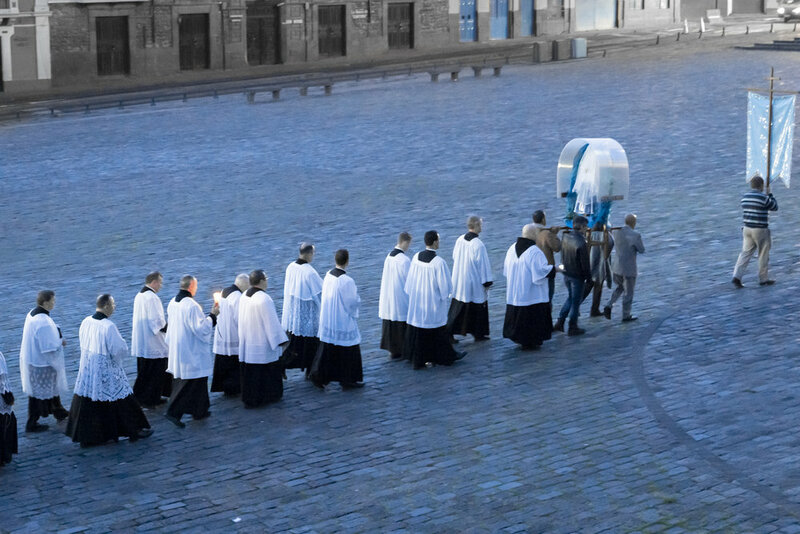 To see the transportation of the miraculous statue, being performed by the Franciscans as traditionally prescribed by Bishop de Ribera was truly a great grace to see. 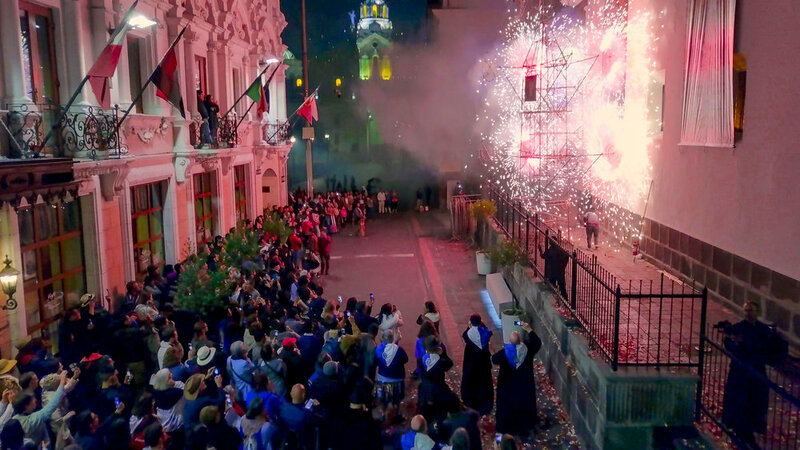 There was almost an electricity in the air, especially among the locals of Quito, who for the first time in their lives witnessed their own clergy preforming this sacred and solemn task. 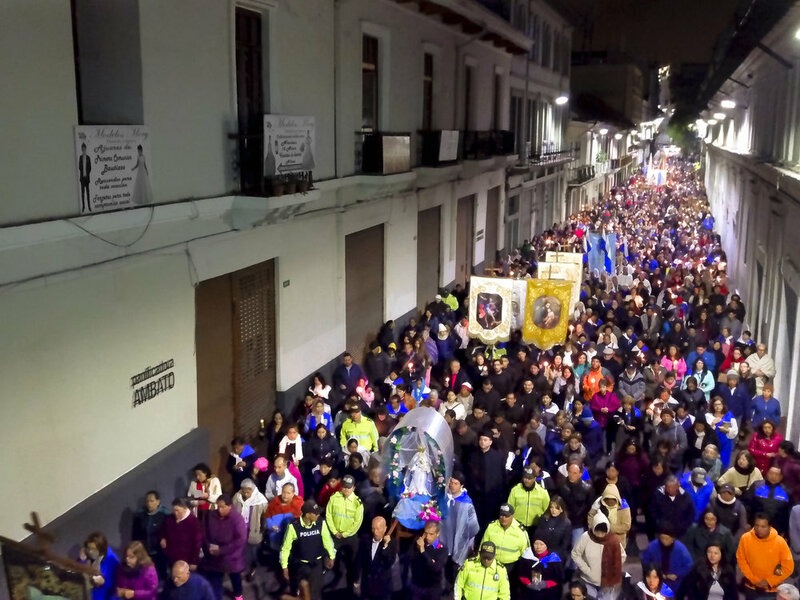 This year in Quito, Ecuador, Archbishop Fausto Gabriel Trávez Trávez, the current Archbishop of Quito, for the first time ever joined in the Fiesta de la Purificación and the Dawn Rosary Procession on February 2nd. 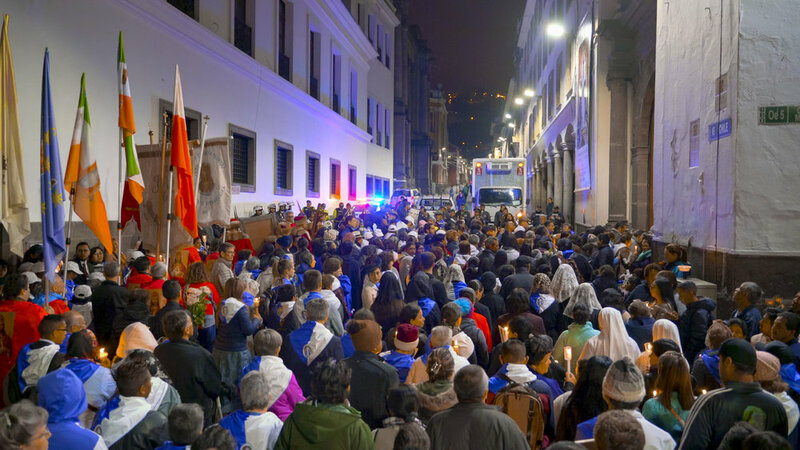 This was also the first time in decades that the Franciscans of the Convent of San Francisco de Quito led the Dawn Rosary procession through the streets of Quito the morning of February 2nd. Below are some of the photos of this historic moment. 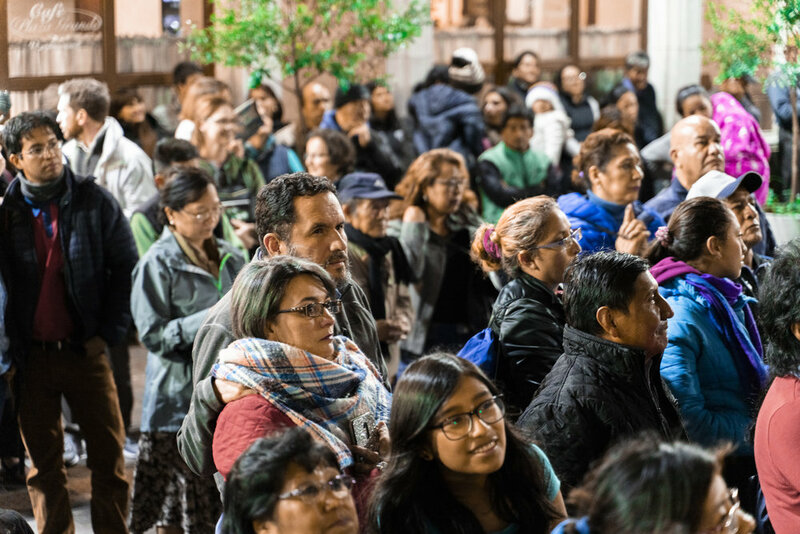 To read more about Maria del Buen Suceso de la Purificación, click here for an article written by Fr. Adam Purdy. 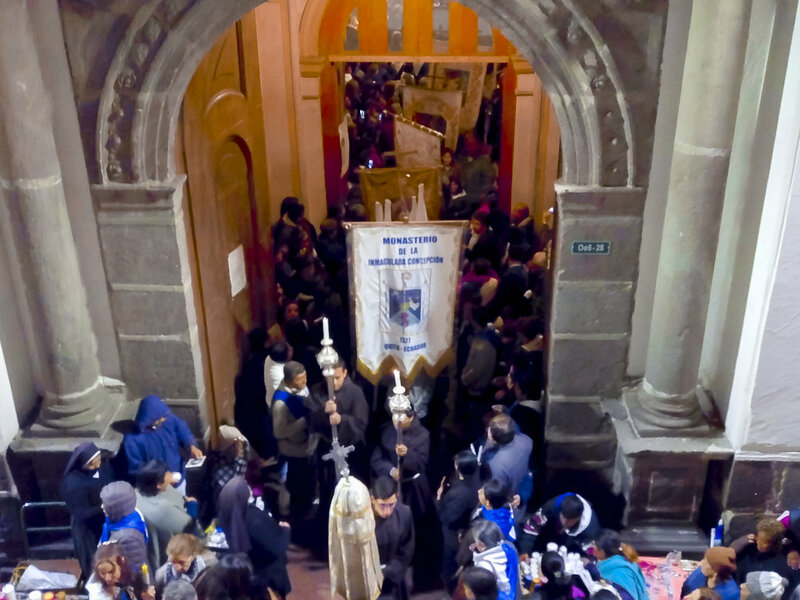 Afterwards, the pilgrims return to the shrine, where several Masses were offered on many altars with the gracious permission of the local ordinary, Abp. Fausto Travez Travez, O.F.M. 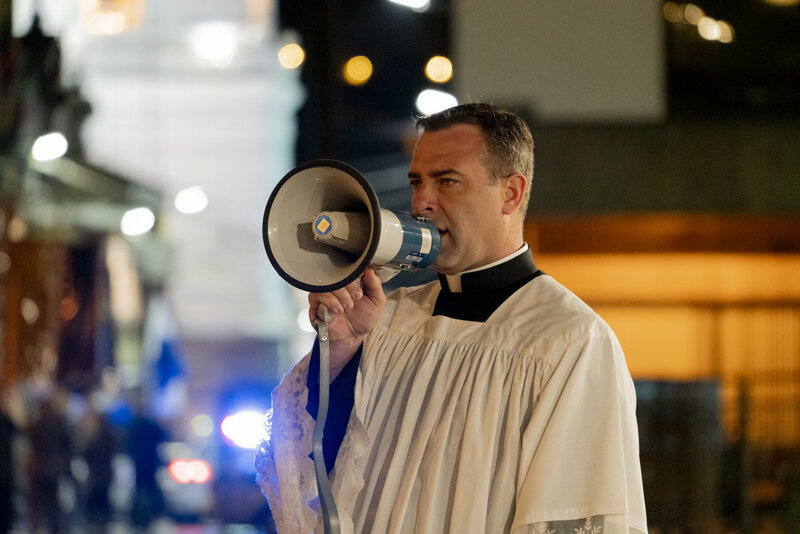 Ask Father Purdy: Why Do You Say Buen Suceso Instead Of Good Success? Mariana de Jesus Torres y Berrichoa was born in 1563 of pious parents. 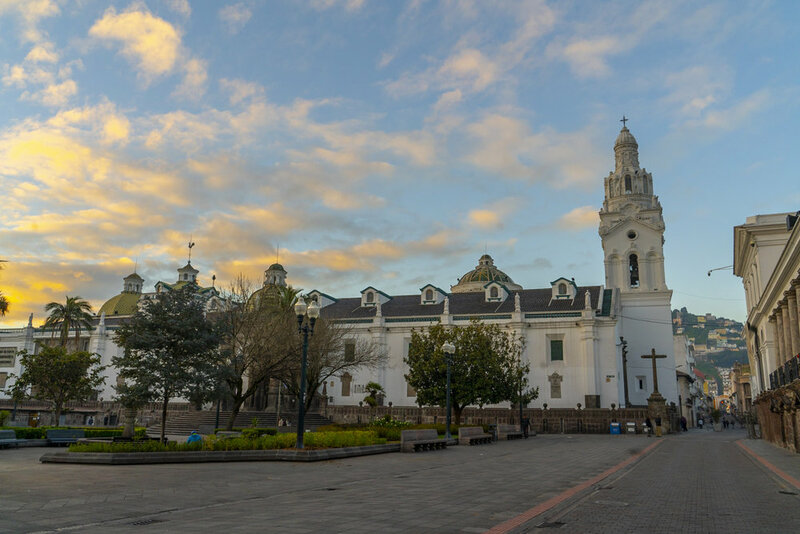 When 13 years old, she entered the Royal Convent of the Immaculate Conception in Quito, Ecuador. With 12 other women, including her aunt, Mother Maria de Jesus Taboada, Mariana was the youngest of the founding mothers of this convent of Franciscan Conceptionists. In 1577, Mariana entered the novitiate and in 1579 she professed. At a young age, Mariana was privileged to receive special favors from God. She received the first of many locutions at the age of seven. At her first communion she went into ecstasy, during which she was betrothed to the child Jesus. By nine years old, she began what is called prayer of quiet. [i] As a novice, her director considered himself unworthy to direct her. At her profession, she went into ecstasy, during which she was espoused to our Lord. During the years of her life, she was guided by Our Lord and His Holy Mother in the spiritual life. Our Lord himself gave her various penances to perform and sufferings for her to offer. He also directed the topics of her silent prayer. By the end of her days she possessed an extraordinary degree of holiness. 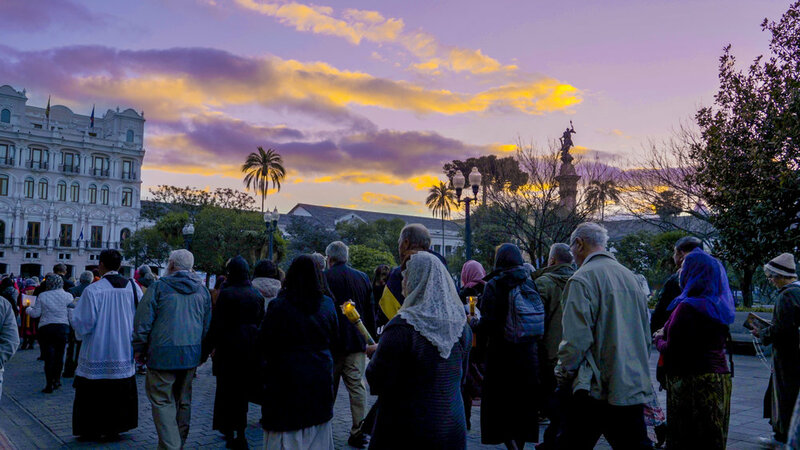 Perhaps one of the most pertinent aspects of Mother Mariana’s life for us today – She was requested by Our Lord to be a victim soul, particularly for the crisis of the 20th century. These dialogues of Our Lord, as well as Our Lady, are the first given to the Church explaining Her condition during the 20th century. These dialogues are also the lengthiest and the clearest, describing particular elements of this crisis. 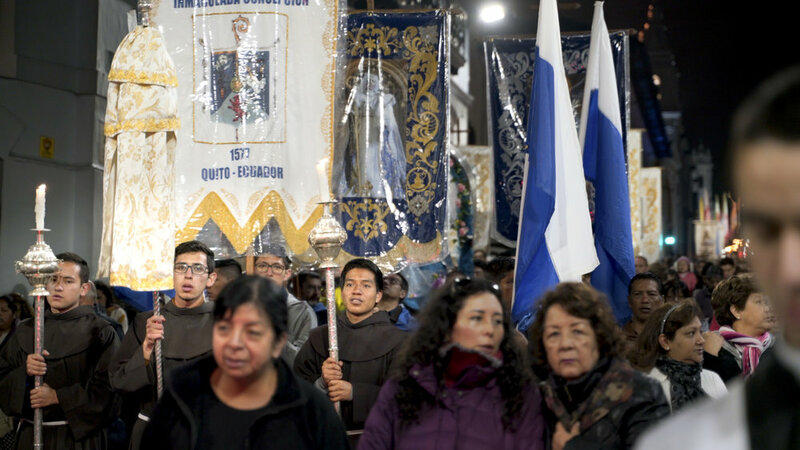 Mother Mariana is requested to take an intimate role in the perseverance and preservation of the Church of this time by her state as victim. 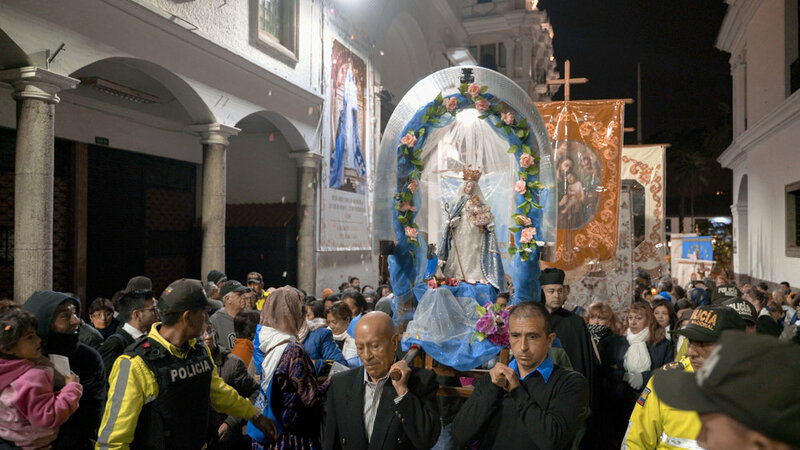 In 1594, the Blessed Virgin Mary appeared to Mother Mariana under the title of Our Lady of Buen Suceso of the Purification. 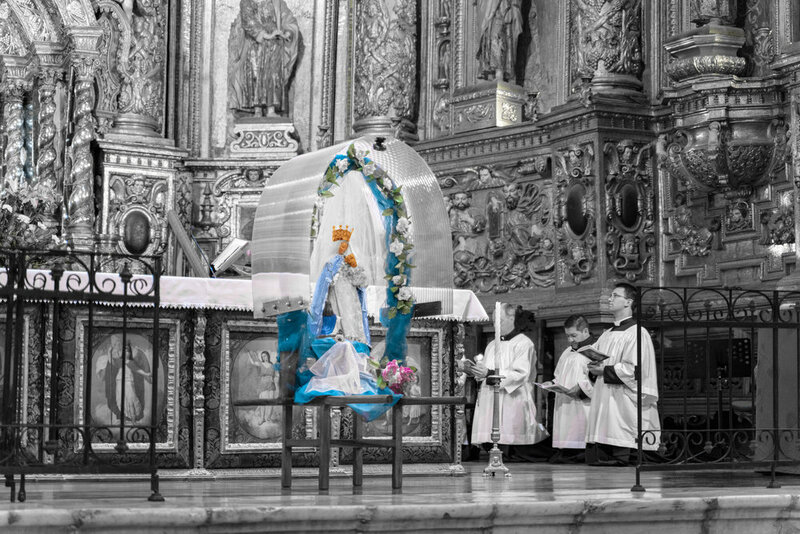 She commanded Mother Mariana to have a statue made according to the features of the apparition. Completed miraculously by the angels and St. Francis in 1611, this statue depicts the Mother of God with the Divine Infant in her left arm, with crozier and keys in her right hand. Shortly after completion, and as mandated by Our Lady, the statue was consecrated with sacred chrism, (as ritually done with bishops, abbots and abbesses) and she was installed as the Mother Abbess of the monastery. From this place, she promised to reside until the end of the world; from this place she would oversee and protect in a special manner all the affairs of the monastery. This is the only monastery in the world in which the Mother of God has installed herself formally as Abbess. It is the only monastery in which she has promised to exercise a significant role. The monastery is affectionately known as the house of Our Lady. The Mother of God also stresses this same point when speaking to Mother Mariana. Mother Mariana served as Abbess of the Monastery for seven terms. Mystical experiences are scattered through the life of this spouse of Christ. Admittedly, there is very little known of this saintly religious. Why have we never heard of her? Why is this the case? In response to this, let us simply state: If the Mother of God wishes to keep something secret – She can do it! It has been 100 years since the apparitions of Fatima, and today we still speak of ‘the Third Secret’. This means there is still something hidden and unknown. 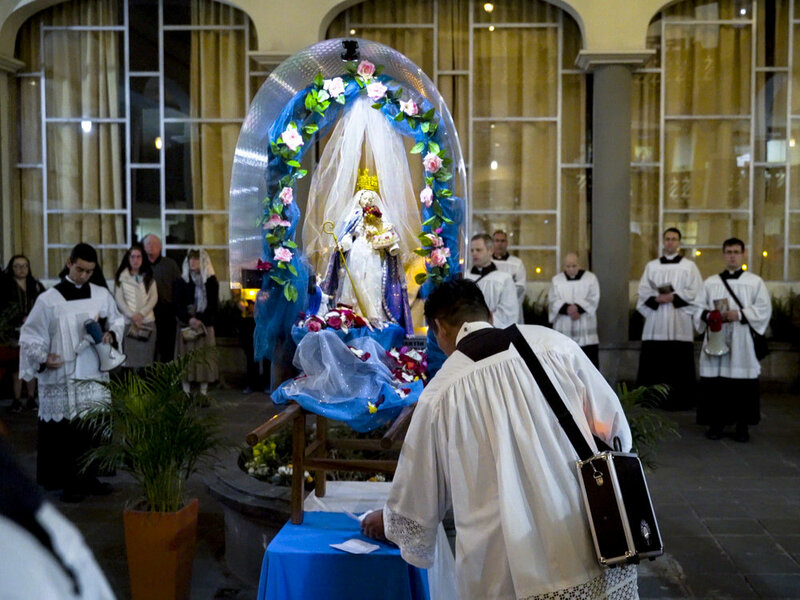 Upon signing the sworn testimony of the miraculous events of the completion of the Statue, Mother Mariana explained to the bishop why she would remain unknown. This (document) and other precious treasures, my successors for fear of losing them, will hide in a cupboard here in my Convent during those public tumults of wars when this Colony tries to become a free republic, because they will not have the light to understand that nothing, nobody can do harm to my Convent. On the one hand, Your Excellency, this will be suitable because my life should come to light in the 20th century, and the rest when the Minors return, unless the humble do violence to heaven to find these (hidden documents and treasures) to guard as precious treasures in this my Convent; for without this intention, no human means will be sufficient to find them. Mother Mariana was very familiar with suffering. During an apparition of Jesus in agony, His Virgin Mother requested Mariana to be a victim for the 20th century. Amidst the darkness of the church, I saw the main altar clearly, as if in full day, and while I was kneeling, the Tabernacle suddenly opened and I saw Christ of the form that was in Golgotha and the Most Holy Virgin, at His feet, St. John and St. Magdalene whose tears were falling like pearls. 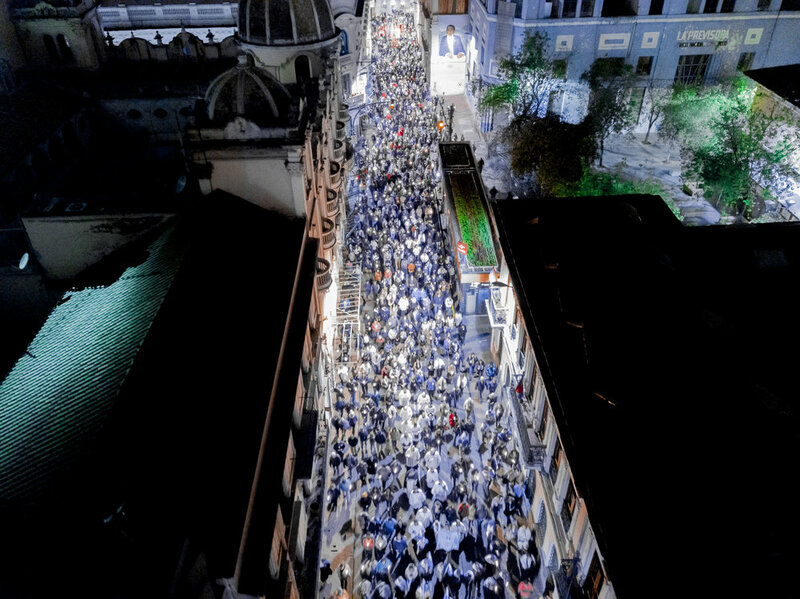 This indeed was the occasion of the first death of Mother Mariana. “My spouse, I desire for you a life of immolation. Your life will be a continuous martyrdom.” With this Our Lord promised her a life of suffering. This indeed is the greatest sign of affection. With suffering, the victim is permitted to unite both body and soul to God. Within the soul, the acts of submission, humility, and obedience cause a profound union with Jesus on the cross who “humbled himself, becoming obedient, even to the death of the cross.” [ix] The interior movements of the soul are the very center of every sacrifice. Moreover, in body, those who suffer are permitted to share in exterior likeness to that of Christ. “He who does not take up his cross daily and follow me, is not worthy of me.” [x] Let us not believe for a moment that Jesus refers only to interior suffering. Mariana would become intimate with Christ in His suffering. These sufferings certainly became true during the life of Mother Mariana. The voluntary penances and sufferings she inflicted upon herself were remarkable. These aside, the sufferings that Mariana experienced from without, those inflicted upon her by Our Lord himself, and what Divine Providence disposed her too suffer at the hands of others – herein lies the true martyrdom. To grow in holiness in these moments requires a complete conformity to the Divine Will – It is required that one willfully embrace those things that are opposed to one’s will. 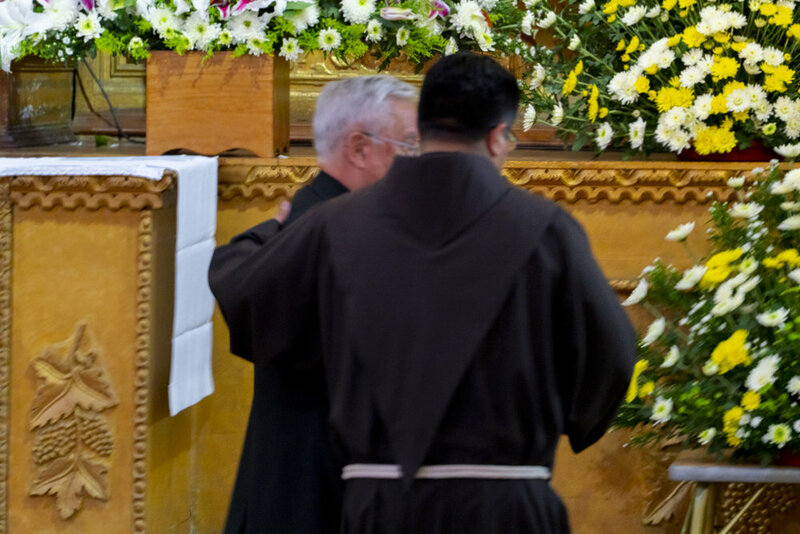 Mariana’s life was characterized with this willful and loving embrace to what inflicted the most suffering. Jesus thus sanctified His spouse by giving to her what was His lot. One example of this kind of suffering was a mystical intimate accompaniment with Jesus during His Passion. She was given to share in His sufferings and afflictions. This was both interior and exterior. Jesus would take from her all spiritual consolation and leave her abandoned, as He also was abandoned by His Father. For those who love more, this abandonment is much more acute. Exteriorly her body also was given to suffer, particularly by the stigmata. Aside from being noticed by fellow sisters on a couple occasions, these wounds were not visible but nonetheless perceived in her body. Another significant suffering and cause of great humiliation was the persecution and imprisonment led by a rebellious faction of sisters. Usually at this point, one questions – imprisonment? 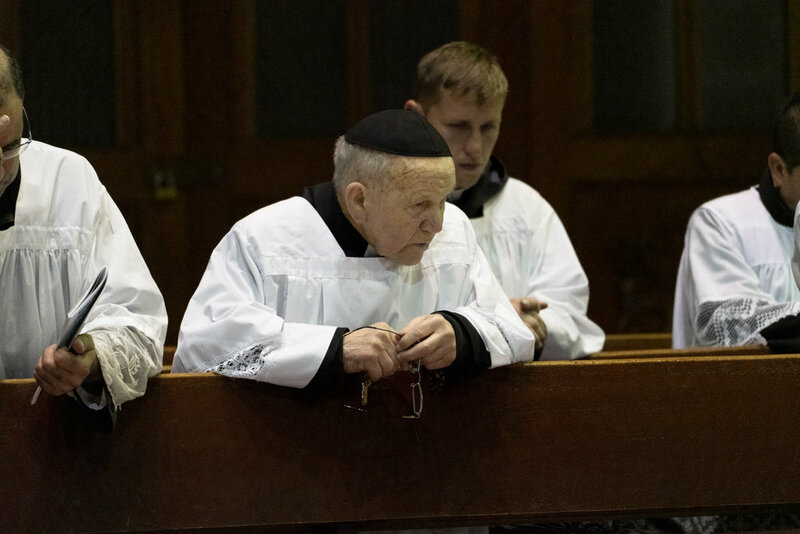 Within the confines of the convent there was a certain austere quarter provided for those who were disobedient or for those who continually failed in their duties. This was similar to what is called solitary confinement. Mariana was imprisoned four times by the influence of the rebellious faction of sisters. The turmoil within the convent lasted almost 10 years. These things happened by false accusations against her. Nevertheless, Mariana offered this persecution in union with her Divine Spouse. A last example of Mariana’s suffering [xiv] was the request of Our Lord for her to suffer five years the pains of hell for the salvation of the most unjust of the rebellious sisters. 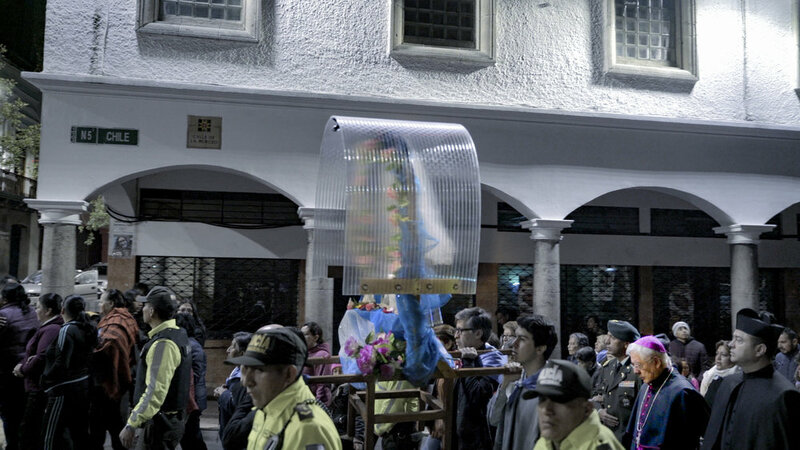 After the good death of the rebellious sister, Mother Mariana embraced this punishment. She suffered the pain of loss and the pain of sense. There is no need of extra words to describe this suffering. 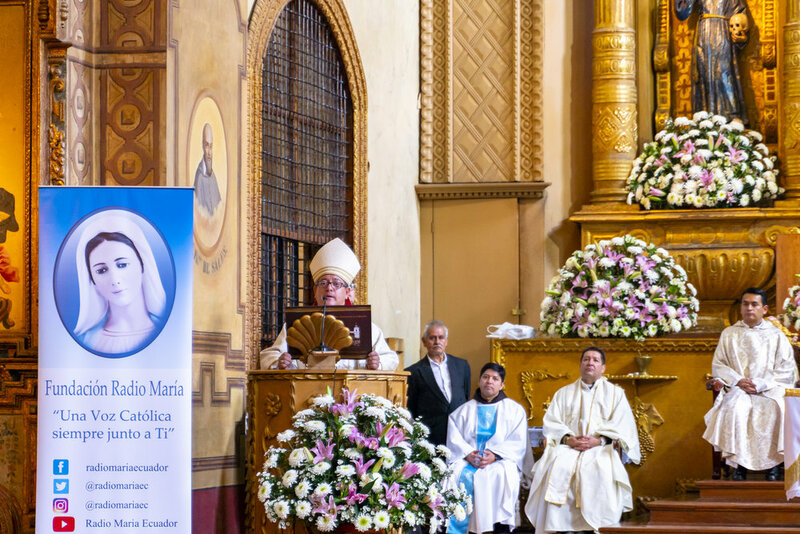 In her humility, Mother Mariana always considered herself unfit to direct her fellow sisters. Our Lady would provide the answer. …and at an indication of the Most Blessed Trinity, the Archangels Michael, Gabriel, and Raphael came before the throne of the Divine Majesty, prepared and ready for some sublime mission. I did not understand what God commanded them, but I saw their profound reverence. They then presented themselves before the throne of the Queen of Heaven. Recognizing her superior to them, Michael said: ‘Mary Most Holy, Daughter of the God the Father’; Raphael said: ‘Mary Most Holy, Mother of God the Son’; Gabriel said: ‘Mary Most Holy, Most Pure Spouse of the Holy Ghost’. Inviting the Angelic militia, they all sang together: Mary Most Holy, Temple and Sanctuary of the Most Holy Trinity. In an instant, with the speed of a bolt of lightning, appeared the August Trinity in the choir where the carved image was and They illuminated it with celestial radiance. At this moment appeared my Seraphic Father so beautiful, from his wounds celestial rays shot forth… (St. Francis) accompanied by the three archangels Michael, Gabriel, and Raphael, followed by the Angelic militia, approached the image made by Señor Francisco del Castillo and in an instant they worked on it again. I did not have the light to understand how this instantaneous work happened, but it looked as beautiful just as Your Excellency saw it. Right after, my Seraphic Father took off his white cord that he wore on his waist, girding with it the waist of the Most Holy Image saying lovingly and reverently: ‘My Lady, I entrust to your maternal love my sons and daughters of the three Orders which I founded and spread throughout the world. I entrust today and forever this my Convent founded under my care’. Mother Mariana would often resort to Our Lady for advice, as well as courage and consolation in difficult matters. The miraculous statue would often speak with Mariana. There are two significant apparitions that deal at length with the topic of the 20th century. 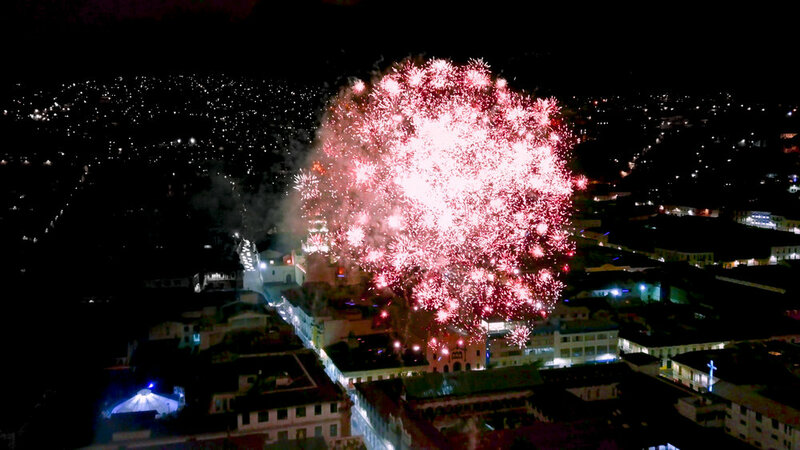 The first was on January 21, 1610. 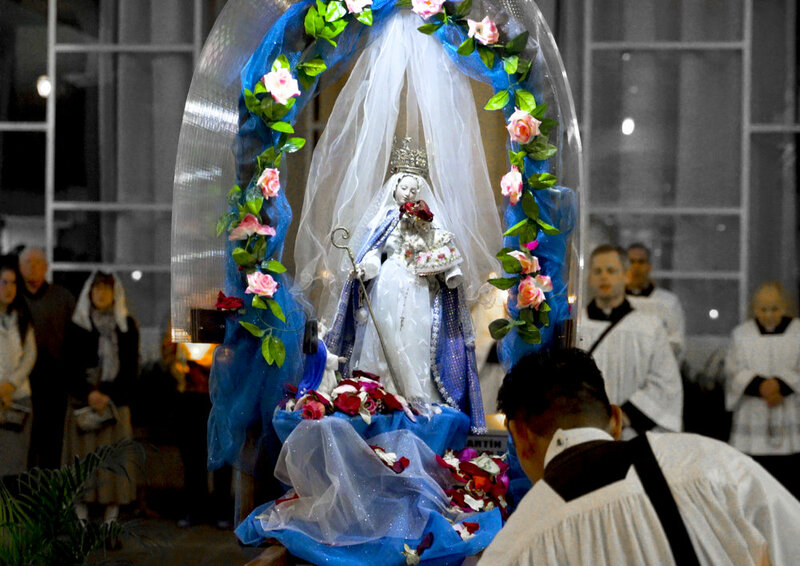 In this apparition, Our Lady of Buen Suceso gives details concerning the Sacraments during this grave period of crisis. This is of particular interest. We see these words being lived today! Imagine the horror this information would provoke during the age in which she lived! I make it known to you that at the end of the 19th century until a little after the half of the 20th century, in what is today the Colony and will then be Republic of Ecuador, the passions will overflow and there will be a total corruption of customs because of the almost total reign of Satan in the masonic sects which principally will strive to corrupt the childhood to maintain the general corruption! Woe to the children of this time! 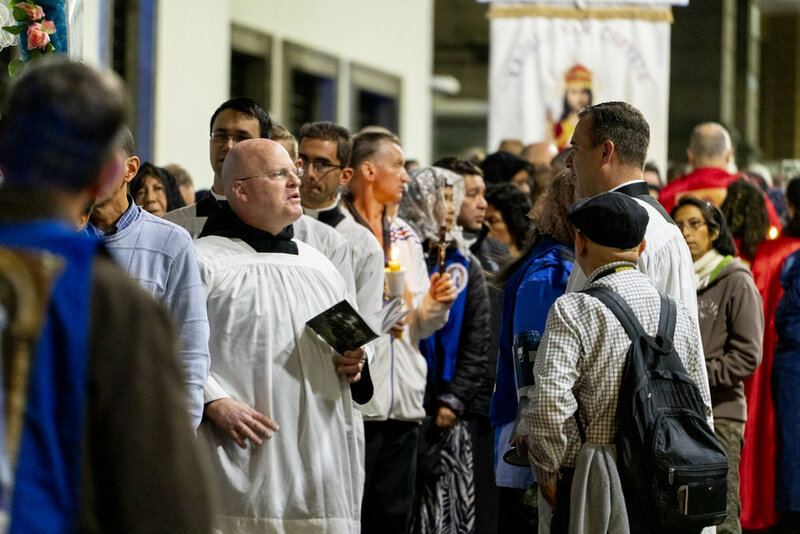 They will receive the sacrament of Baptism with difficulty; Confirmation will be the same; The sacrament of Penance only when they remain in Catholic schools, in which the devil will put all efforts to destroy them using authorized persons. The sacrament of Communion will be the same way. But, oh, how I regret to manifest to you that there will be many and great sacrileges, public and also secret, profaning the Holy Eucharist! 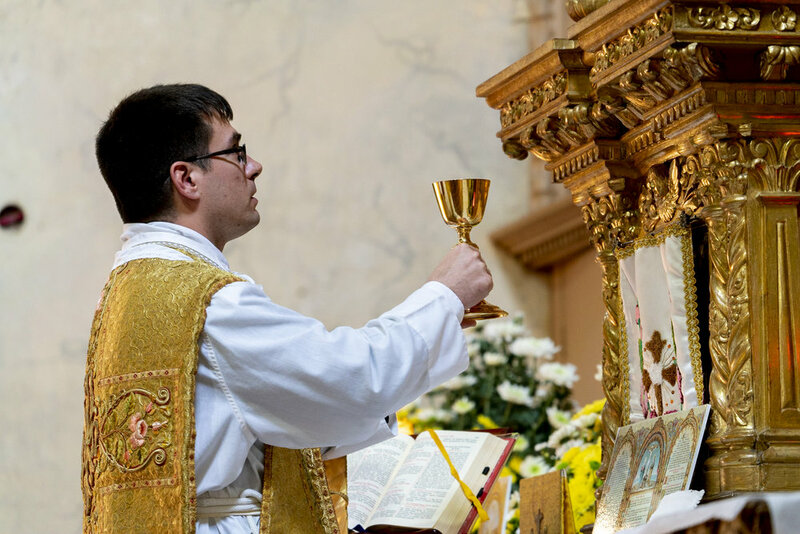 How often during this period they, the enemies of Jesus Christ instigated by the devil, will rob the Consecrated Hosts in the cities, only to profane the Eucharistic species! My Most Holy Son will be seen fallen on the floor and trampled by filthy feet. 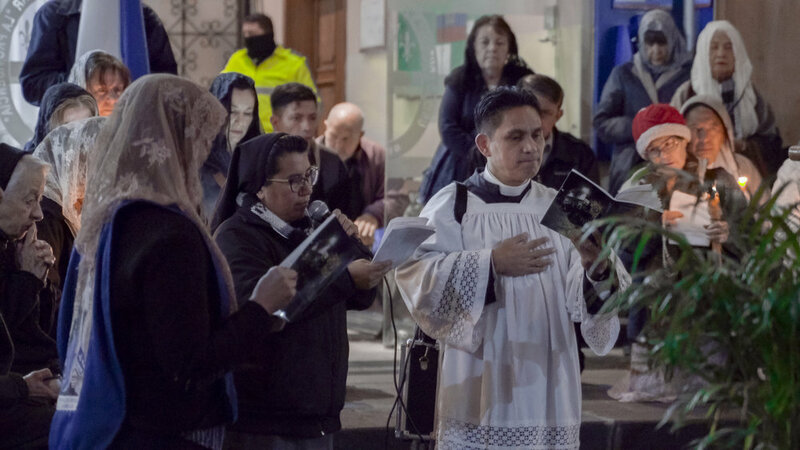 …and in this my Convent, there will be faithful souls, fervent spouses and lovers who will make reparation with loving tenderness, suffering from seeing (Him)so hated by their ungrateful brethren, those sinners who will seem to have no human heart. The astute devil will attempt to impede this, putting ideas of despair in the imagination of my suffering daughters, to make them lose the merit. But in those times they will already know you and also the favors that I have dispensed to you. How I love the happy inhabitants of this sacred enclosure! This knowledge together with the love and cult to my sacred image, which I strictly order you today to have made as you see me. Put me upon the Abbess’s chair, so that from there I will govern and rule my daughters and sustain my convent against the fierce determination that Satan will have to destroy it, availing of good and bad men. By this time, in this poor country which will lack the Christian spirit, the Sacrament of Extreme Unction will be little respected. Many people will die not receiving it, because of the neglect of families, because of misconceived affection towards the sick, and also because of some who oppose the Catholic Church, instigated by the accursed devil, depriving the souls of many innumerable graces, consolations, and strength to make the big leap from time to eternity. Some will also die without receiving it by the just and secret punishments of God. 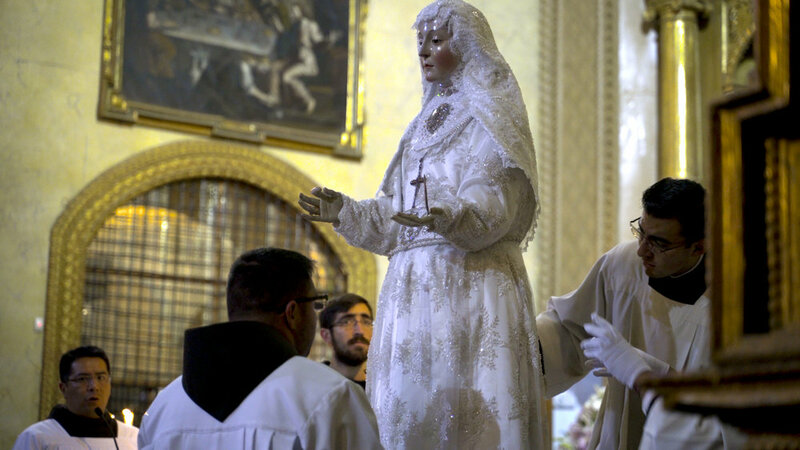 The sacrament of Matrimony which represents the union of Christ with the Church will be attacked and profaned in the full extent of the word. The rule of Masonry will establish its laws to extinguish it, facilitating all to live immorally and propagating the procreation of illegitimate children; without the blessing of the Church, the Christian spirit will rapidly decline, extinguishing the precious light of the faith until it reaches an almost total and general corruption of customs. This, together with secular education, will be the reason for dwindling of priestly and religious vocations. 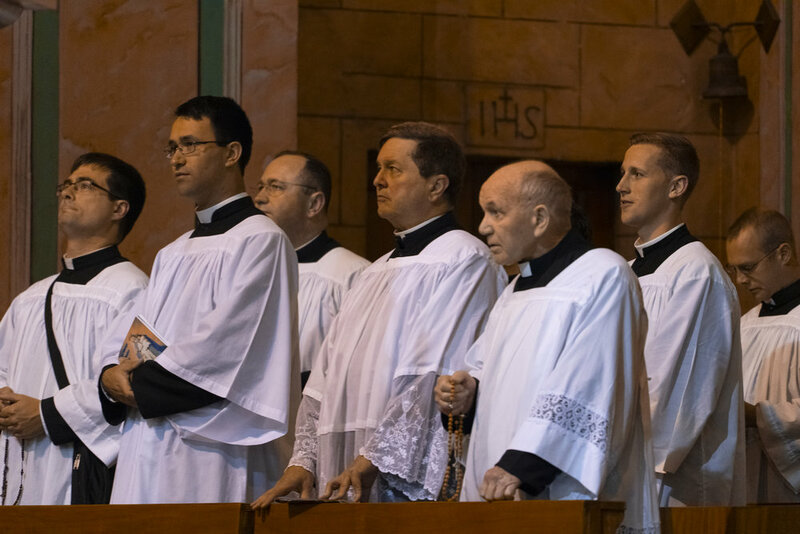 The sacrament of Holy Orders will be mocked, oppressed, and despised because they (masonic sects) oppress and violate the Church of God, and God Himself in his priests. Then the devil will endeavor to persecute the ministers of Our Lord in all ways and will labor with cruel and subtle astuteness to deviate them from the spirit of their sublime vocation, making them degenerate into debauchery. 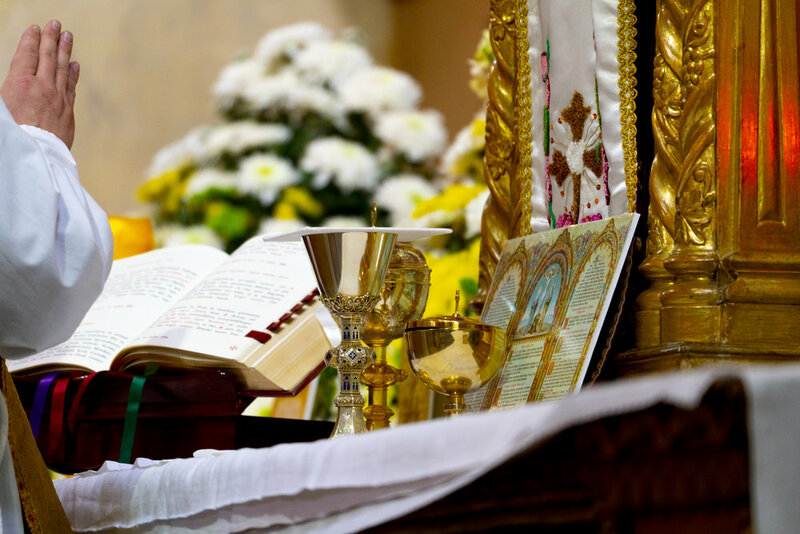 Scandalizing the Christian people many times, they (the bad priests) will draw upon all the priests the hatred of the bad Christians and of the enemies of the Roman, Catholic and Apostolic Church. 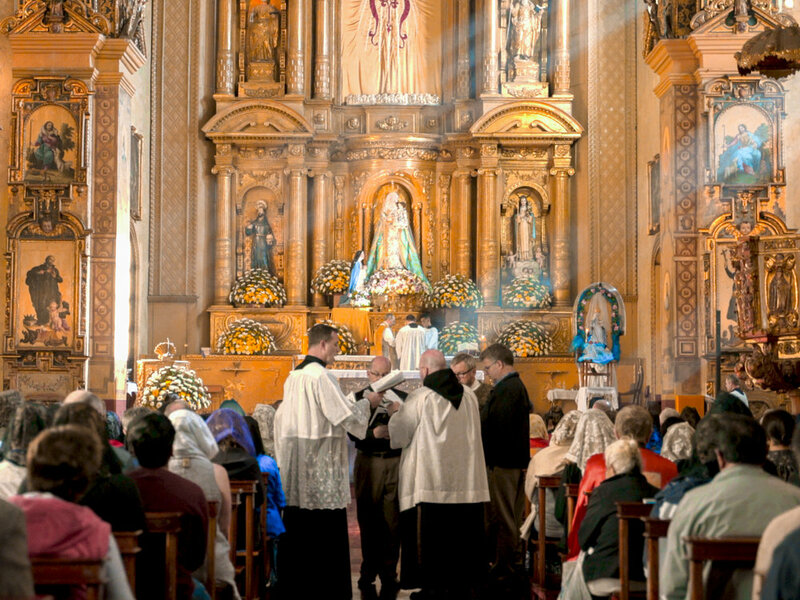 With this apparent triumph of Satan, they will draw immense sufferings on the good pastors of the Church, and on the great majority of good priests, and the Supreme Pastor and Vicar of Christ on earth who is prisoner in his Vatican will shed secret and bitter tears in the presence of God and his Lord begging for light, sanctity, and perfection for all the clergy of the whole world, of whom he is king and father. Moreover, in these ill-fated times, there will be unrestrained lust which will captivate countless frivolous souls who will be lost for being the snare of sin for the others. Innocence will almost no longer be found in children, nor any sense of shame in women. 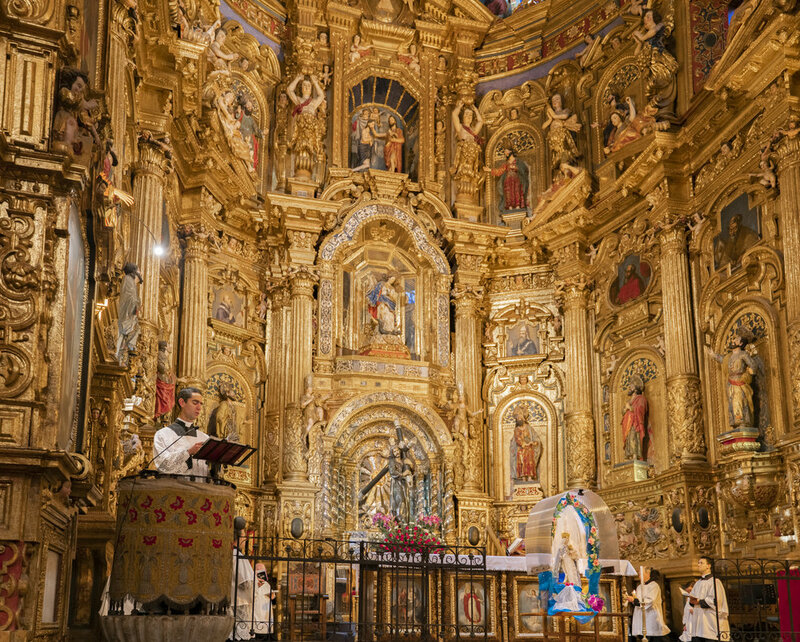 On February 2, 1634 Mother Mariana was praying in the upper choir in the middle of the night, as was her custom. She saw the sanctuary lamp go out leaving the main altar completely dark. She thought to go and rekindle the lamp, but when attempting to move, she was unable. 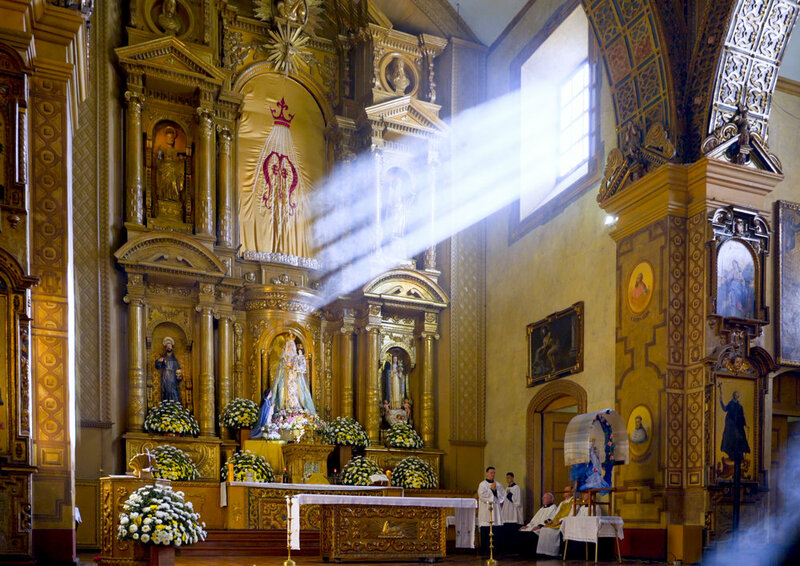 Then Our Lady of Buen Suceso appeared and lit the Tabernacle lamp. The Blessed Virgin then spoke to Mother Mariana. …the lamp that burns before the Prisoner of Love and that you saw extinguished has many meanings. The first is that at the end of the 19th century and will continue to a large part of the 20th century, various heresies will spread in these lands, then already a Free Republic. The precious light of the faith will be extinguished in the souls by the almost total corruption of customs; in this time there will be great physical and moral calamities, public and private. The small number of souls, in whom will be preserved hidden the treasure of the Faith and of the virtues, will suffer a cruel and unspeakable as well as prolonged martyrdom. 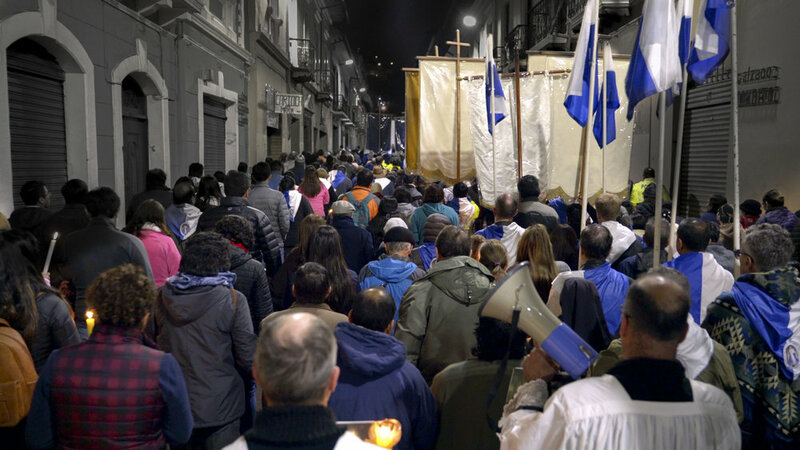 Many of them will descend to the grave from the violence of the suffering and will be counted as martyrs who sacrificed themselves for the Church and for the Country. In order to be freed from the slavery of these heresies, those whom the merciful love of my Most Holy Son will destine for this restoration will need great strength of will, constancy, valor and much confidence in God. To put to test this Faith and confidence of the just, there will come moments in which everything will seem lost and paralyzed, and then will be the happy beginning of the complete restoration. The third reason why the lamp was extinguished is in these times there will be an atmosphere filled with the spirit of impurity which, like a filthy ocean will flow through the streets and squares and public places with an appalling liberty so that there will be almost no virgin souls in the world. The delicate flower of virginity, like a flower that is timid and threatened with complete destruction, will shine far, taking refuge in the cloisters. It will find suitable land to grow, develop, and live, its fragrance being the delight of my Most Holy Son and the lightning rod that holds back the Divine wrath, without which, it would be necessary to rain fire from heaven to purify these lands. The fourth reason why the lamp was extinguished is that the sect, having seized all social classes, will have so much subtlety to introduce itself into domestic households that, ruining childhood, the devil will glory in preying the exquisite delicacy of the hearts of the children. In those ill-fated times, childlike innocence will barely be found. 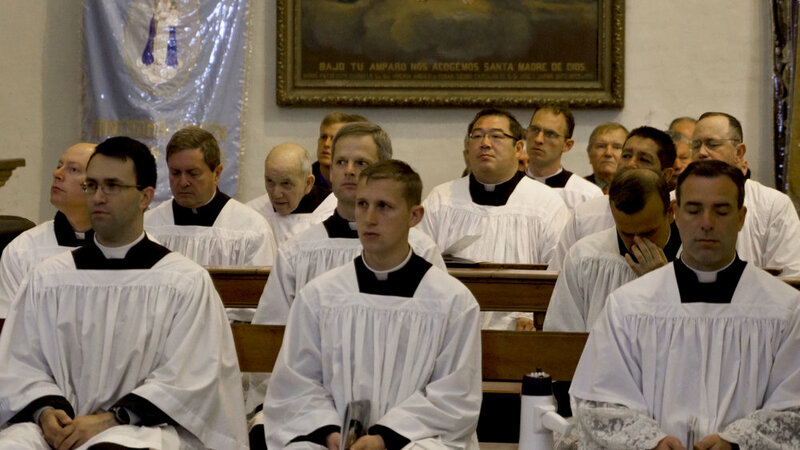 In this way, vocations to the priesthood will be lost, which will be a true calamity. The religious communities will remain to sustain the Church and to work with valiant and selfless determination in the salvation of souls. 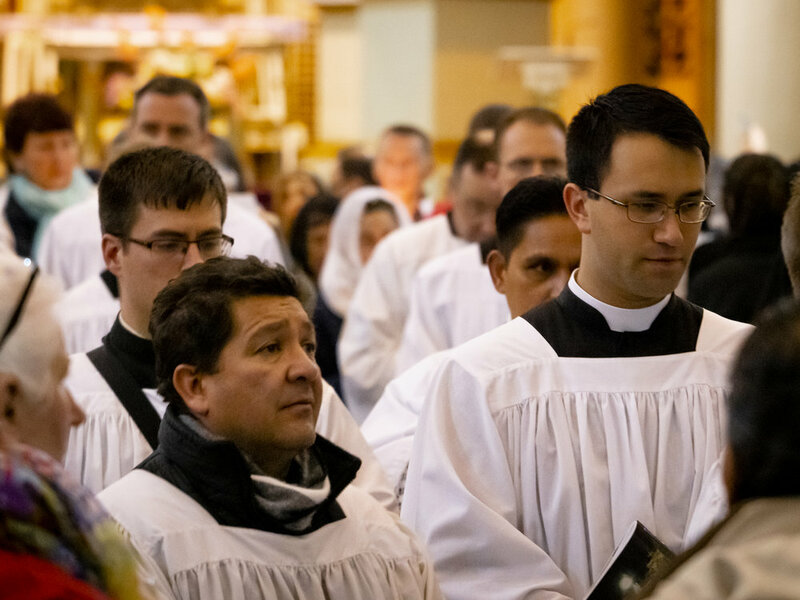 It is because at this time the regular observance will shine in the communities; there will be holy ministers of the altar, hidden and beautiful souls in whom my Most Holy Son and I will take delight, with the exquisite flowers and fruits of heroic sanctity. Against these ministers, impiety will wage a cruel war and fill them with vituperations, calumnies, and vexations to impede the fulfillment of their ministry; but they, like most firm columns, will remain steadfast, confronting everything with the spirit of humility and sacrifice, with which they will be clothed, in virtue of the infinite merits of my Most Holy Son who loves them like the most delicate fibers of His Most Holy and Tender Heart. 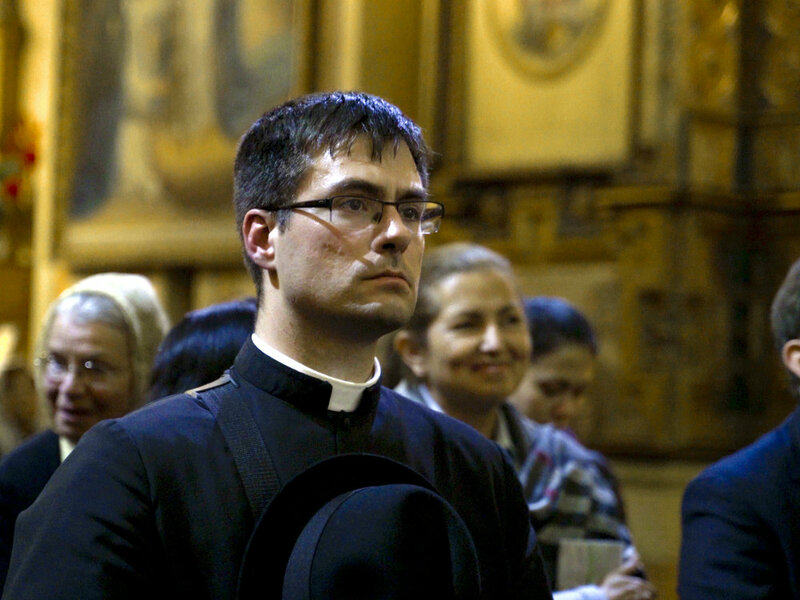 In those times, in the secular clergy there will be much to desire because the priests will neglect their sacred duty. Losing the divine compass, they will stray from the path charted by God in the priestly ministry, becoming fond of money and striving to obtain it to excess; and since this Church will suffer the dark night of the lack of a Prelate and father who watches over with paternal love, with gentleness, strength, sound judgment, and prudence, many of them will lose their spirit, placing their souls in great danger. Pray insistently, clamor without tiring and weep with bitter tears in the secrecy of your heart, asking our Celestial Father that for the love of the Eucharistic Heart of my Most Holy Son, for this Precious Blood poured out with so much generosity, and for the profound bitterness and sorrows of His bitter passion and death, that he be compassionate to his ministers and put an end as soon as possible to these so ill-fated times, sending to this Church the Prelate who must restore the spirit of Her priests. 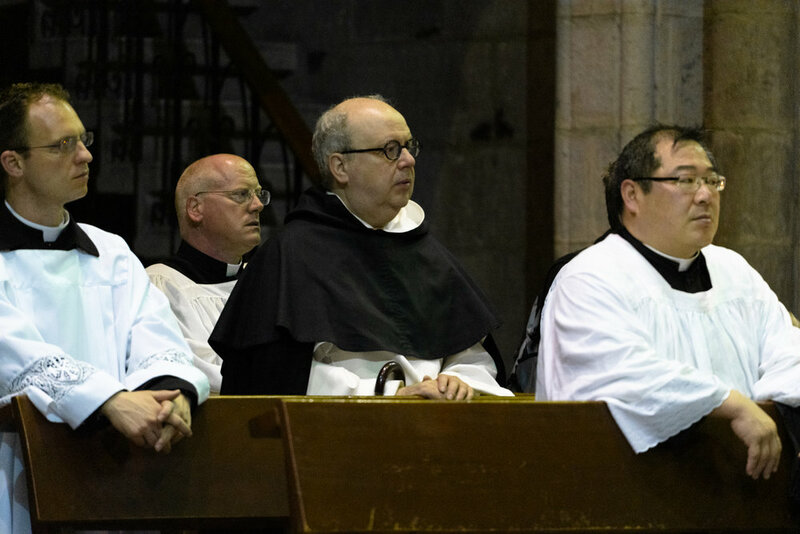 …With divine gentleness, he will guide the consecrated souls to the divine service in the cloisters without making heavy to them the yoke of our Lord. 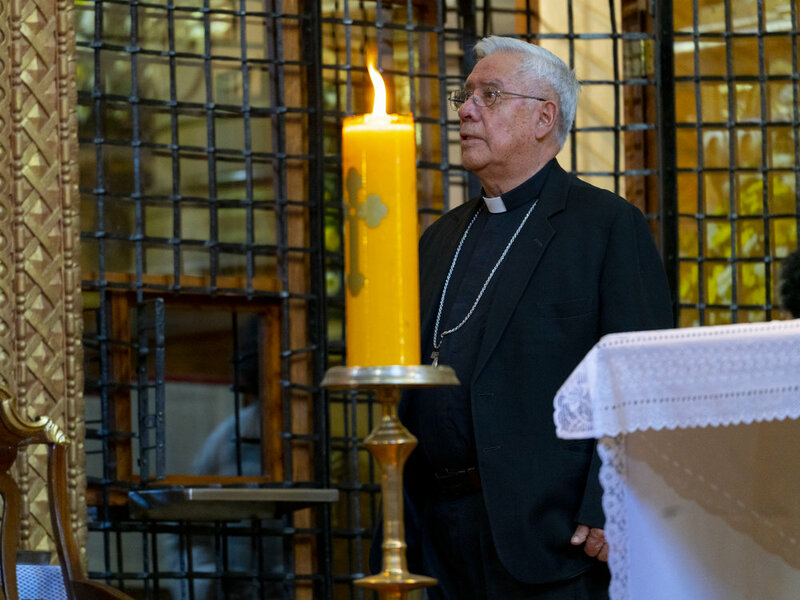 To have the prelate and father soon, they (those consecrated souls) will counterbalance the tepidity of all the souls consecrated to God in the priestly and religious state. This is the precise cause of the accursed Satan taking possession of these lands, who will obtain it all by means of so many foreign faithless people, which like a black cloud will obscure the clear sky of the then republic consecrated to the Most Sacred Heart of My Divine Son. Introduced by these faithless people are all the vices; because of them are all types of chastisements – among them pestilence, famine, and conflicts among themselves and other nations – losing a considerable number of souls so dear to Jesus and me because of apostasy. To dissipate these black clouds which prevent the possession of the clear day of liberty of the Church, there will be a formidable and frightful war in which blood of their own and strangers, of secular and regular priests, and also of religious will flow. This night will be most horrible because to mankind, evil will seem to be triumphant. Then is the coming of my hour, when I, in an amazing way, will dethrone the proud Satan, crushing him under my feet and chaining him in the infernal abyss, finally freeing the Church and country from his cruel tyranny. 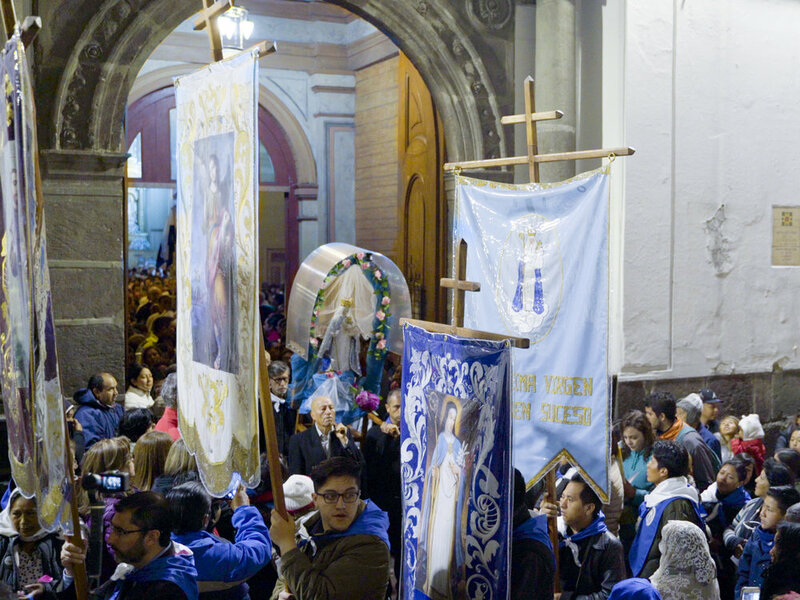 Mother Mariana offered her life as a pleasing sacrifice for the Church of the 20th century. Our Lord alone knows what she has merited by her cooperation and sacrifice. It is not unreasonable to assert that she is connected with the perseverance of the Church during this time. 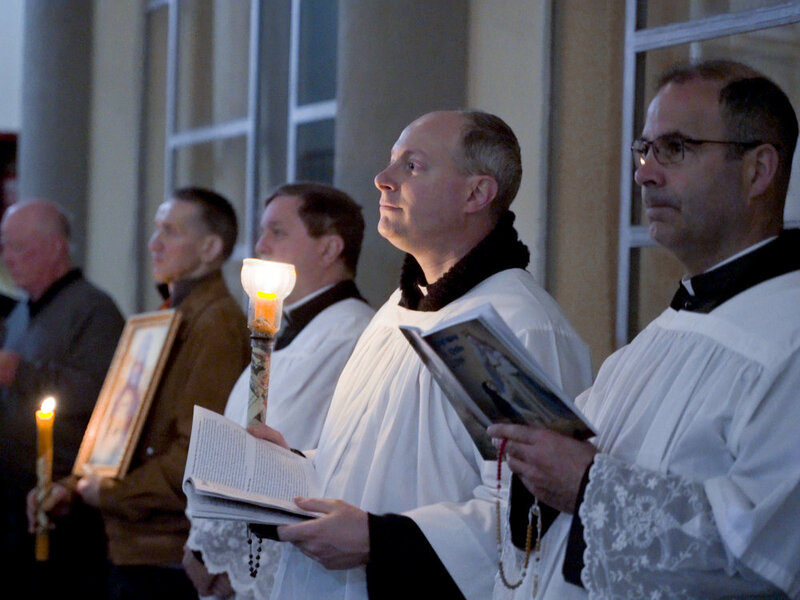 Perhaps the work of tradition and the preservation of the Church is also due to her sacrifice? Perhaps the person and work of Archbishop Lefebvre was instigated and birthed through her? God knows! These themes are repeated on other occasions – the preservation of the convent; the presence of at least one or two hidden saintly religious; the predilection of this convent by Christ and His Holy Mother. This repetition must have a reason; it is clear this convent has a significant role to play. 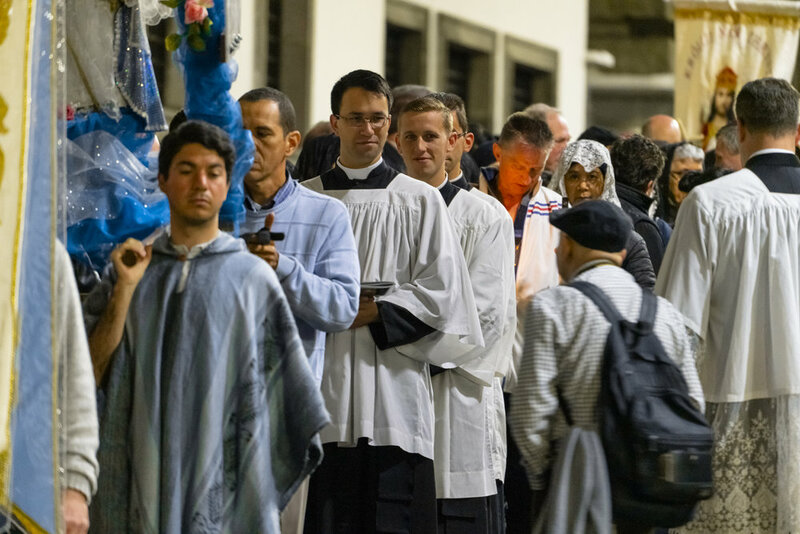 ...these beautiful tunics are also for the secular and regular priests and lay people of both sexes, who, loving my Most Holy Son and myself with simple and upright hearts, love this Convent of our predilection. 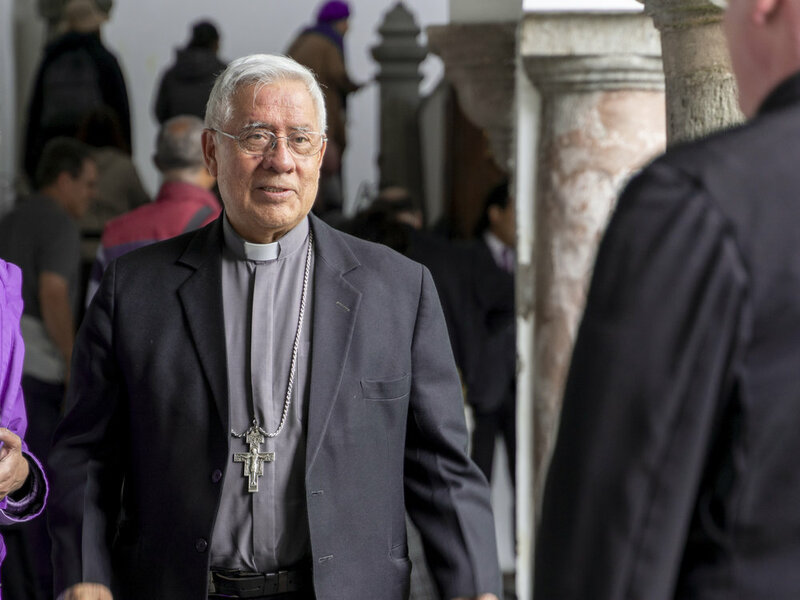 Ignoring criticism and ridicule, they work for its preservation and strive in propagating my devotion under the consoling invocation of Buen Suceso de la Purification which will be, in the almost total corruption of the twentieth century, the support and safeguard of the faith. The devotion to Our Lady under this title will mark the beginning of her time, the time of restoration and triumph of the Immaculate Heart of Mary. 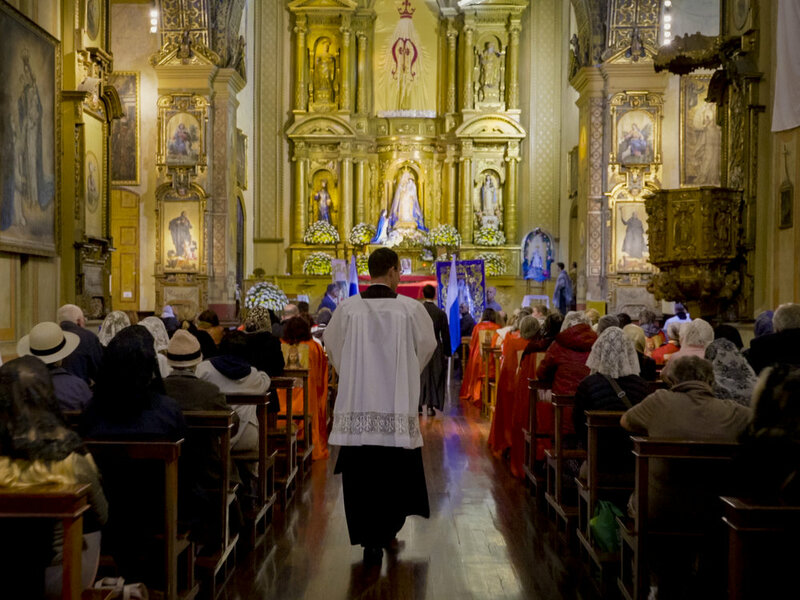 Maybe the work of Tradition, those religious communities who will sustain the Church, is to spark this devotion? If so, let us help! i This is a type of mystical contemplation in which the soul experiences an intimate awareness of God’s presence and fills the soul and body with an ineffable sweetness. ii Pereira, Manuel Sousa; Vida Admirable de la Rda. 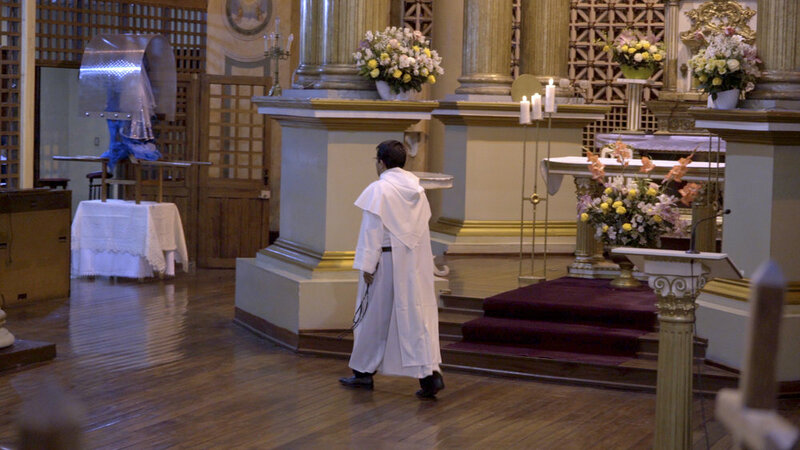 Madre Mariana de Jesus Torres. Tomo Primero. Cap. 30. Independent translation. iv Pereira, Manuel Sousa; Vida Admirable de la Rda. Madre Mariana de Jesus Torres. Tomo Segundo. Cap. 5.
vi Idem. Tomo Primero, Cap. 33.
viii Pereira, Manuel Sousa; Vida Admirable de la Rda. Madre Mariana de Jesus Torres. Tomo Primero, Cap. 10.
xi Pereira, Manuel Sousa; Vida Admirable de la Rda. Madre Mariana de Jesus Torres. Tomo Primero, Cap. 6.
xii The year was 1619. Mariana died in 1634.
xiii Pereira, Manuel Sousa; Vida Admirable de la Rda. Madre Mariana de Jesus Torres. Tomo Segundo, Cap. 1.
xiv There are 750 pages of details concerning many events, sufferings, trials, etc. I list only a few which have particular importance as they someone define the others.